Snowpack is the lifeblood of the U.S. Rocky Mountain west and other mountainous areas of the world. Although mountain ranges cover a very small fraction of the Earth's land regions, the water stored in their snowpack feeds lakes and rivers, which irrigate crops and supply water for many of the world's heavily populated areas. Ski areas bring in tourist dollars that bolster or even form the backbone of local economies. Snowpack is not always beneficial though. Large amounts of money are spent on public transportation and safety during snow events, and dozens of people are killed annually in avalanches. As winter transitions to spring, rapid snowmelt can cause flooding and flash flooding, even when atmospheric conditions are dry. In addition, dry winters can worsen drought conditions. Snowpack assessment is the measurement and interpretation of snowpack. It is needed by hydrologists and those involved with commerce, public safety, and recreation to deal with the concerns outlined above. The data are also critical to climate researchers who use them to monitor climate trends. Scientists in other disciplines use snowpack data as well. For example, biologists use them to study the impact of snow on animal migration and the daily life cycles of burrowing animals, and chemists use them to examine how chemical components become part of the clouds, precipitate into snowpack, and are contained in runoff. Dr. Ethan Greene is the director of the Colorado Avalanche Information Center (CAIC), which issues backcountry avalanche forecasts and educates the public about avalanche conditions and dangers. At various points throughout the module, Ethan will discuss topics related to snowpack development and evolution. He will also demonstrate manual snowpack assessment techniques. Here is his introduction. "Hi, my name is Ethan Greene and I'm the director of the Colorado Avalanche Information Center. We're responsible for assessing the avalanche conditions around the state of Colorado and we do this through meteorology, forecasting, and avalanche forecasting. Part of avalanche forecasting is collecting information from the field so today we're up here in Caribou above the town of Nederland in the Front Range mountains of Colorado to take a look at the snowpack, see how it's formed, and how the stability is progressing." Matt Kelsch is a meteorologist at the University Corporation for Atmospheric Research. Hear him discuss hydrologic concerns regarding snowpack. “Information on snowpack is very important for hydrologic concerns about water supply and the potential for flooding or drought. The difference between replenishing groundwater in one case and flood-producing runoff in another can be simply a matter of the timing, speed, and efficiency of snowmelt. Dr. Doug Wesley is a meteorologist at the University Corporation for Atmospheric Research. 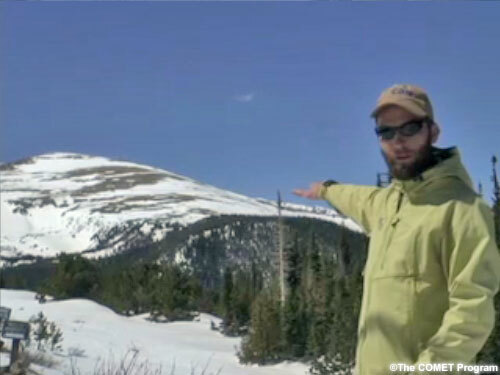 Here he talks about forecasting concerns and snowpack assessment. “For forecasters, snowpack assessment information is vital to carrying out their mission of enhancing winter mountain safety, predicting floods, and informing emergency managers and transportation representatives of dangerous snowpack conditions. Forecasters in complex terrain predict snowfall densities operationally. This information is used in two primary ways: first, to predict the depth of new snowfall and the impact of the storm; and second to update the snowpack status in terms of new layers and stability conditions. Jay Irwin is a backcountry skier who survived an avalanche in 2009. Here's his story. “Hello, my name is Jay Irwin and I’m fortunate to be an avalanche survivor. Last year, I was in the backcountry of CO, skiing a well-known backcountry slope called Cupcakes, right off of Ptarmigan Peak. I had checked the Colorado Avalanche Information Center website and seen that the danger rose had been reduced from red to orange—from high to considerable. One of my rules is to never ski in the backcountry when it’s red or black—high or extreme. It’s just not worth it. However, orange is a gray area for me. On this particular day, I knew there were three feet of fresh powder. But when I saw that the snow had consolidated, I felt a little safer and decided that I would be able to do the run. As I went down, I got mesmerized and continued to ski down through the powder and the trees. It was phenomenal. It felt safe. And my ego got the better of me. When I reached Ptarmigan Knob, a well-known avalanche chute, I stood there for a while and looked at the snow. I knew that it had reduced and packed down, and I decided not to dig a hasty pit. I’d been skiing for a few days and had had phenomenal snow and phenomenal success. I decided not to go down the chute and started hiking back up. But with three feet of snow, it was slow going. So I decided to try and see if I could cut the slope off at the top and see if it would go. As I made that slice, nothing went. So I thought that I could make five turns and be in the trees and be safe ... or go into an opening and potentially outrun anything that came after me. I made three turns, three of the most incredible turns of my life. Snow over the head, coming over the shoulder. But as I made the third turn, I watched the entire face of the mountain break loose. It spidered. It whumpfed. And I saw it go fifteen to twenty feet over to my right. I took it all the way back to where I had made the cut and then across the back. And the entire slab of snow took me down. It took me down Two-birds Chutes, hitting trees along the way at high speed. I broke my pelvis and leg, but was fortunate enough to swim and stay above the slab. I was only buried to my chest. I was able to dig out and get out of there eight hours later. 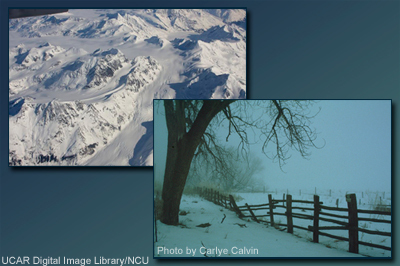 This module introduces you to the science of snowpack and its assessment. We begin by exploring the factors involved in snowpack development and evolution. The evolution section is structured around two scenarios differentiated by terrain: one takes place in a relatively flat area, the other in a mountainous region. 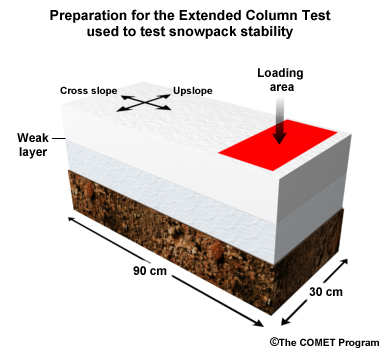 The final section examines both in-situ (onsite) and satellite-based snowpack assessment techniques. 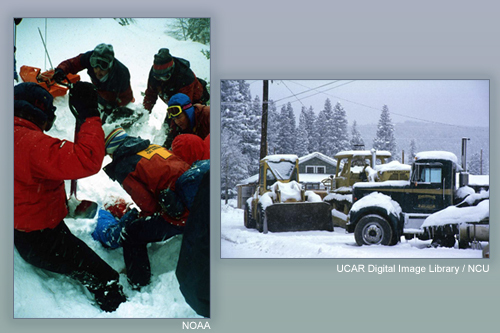 The module is intended for those interested in snowpack and its assessment, including weather forecasters, emergency managers, hydrologists, recreationalists, and climate researchers. To get the most out of the module, it is useful to have a basic understanding of Earth's surface and atmosphere, including geography, precipitation, wind, and temperature. Why do certain parts of the world receive a lot of snow while other places at similar latitudes are arid? The difference is due to climate, climate being the set of meteorological conditions that prevail in a particular place over a long period of time. 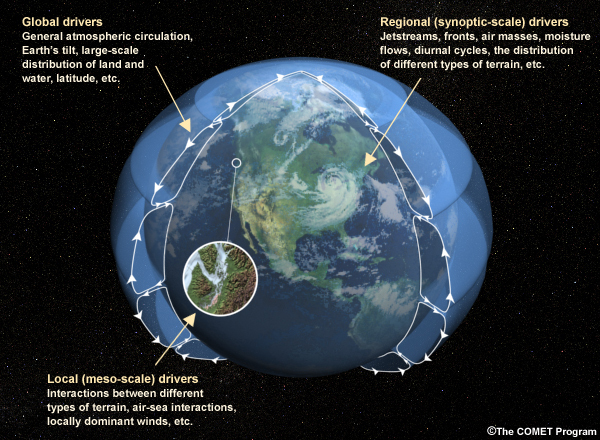 Climate is determined by a wide range of factors at the global, regional, and local scales. Examples are displayed on the graphic. In this section, we will describe the types of snowpack found throughout the world and examine the global-scale factors that create and impact snowpack. 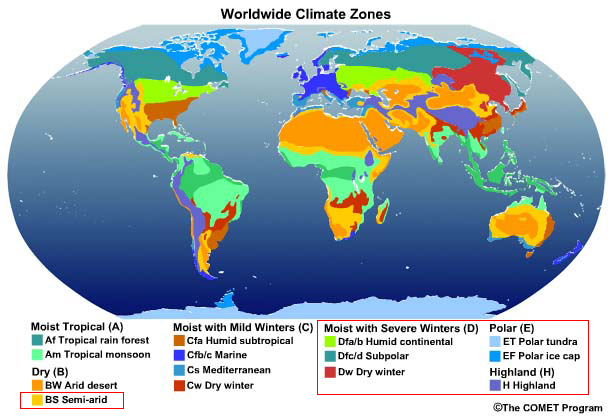 Various schemes are used to categorize the world's climate zones, notably the Köppen-Geiger climate classification scheme. Roll your mouse over the names on the graphic to see the regions that they encompass. Which zones would you expect to have snowpack during part or all of a given year? Select the correct choices below, then click Done. The correct answers are a, b, c, d, e, f, and h.
Regions of semi-permanent snowpack (Polar tundra and Polar ice cap) are found at high latitudes across the globe. Seasonal snowpack is found at high elevations in all latitudes (Highland, Moist with severe winters, and Semi-arid). Terrain is a major factor in determining the environment for snowpack. Most mountain ranges of the world receive enough snowfall to create annual or permanent snowpack and are in the Highland climate zone. 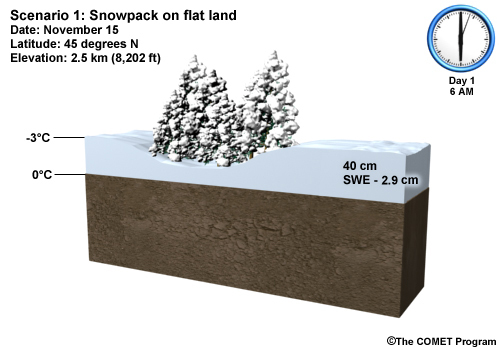 The factors that create climate also produce various types of snowpack. 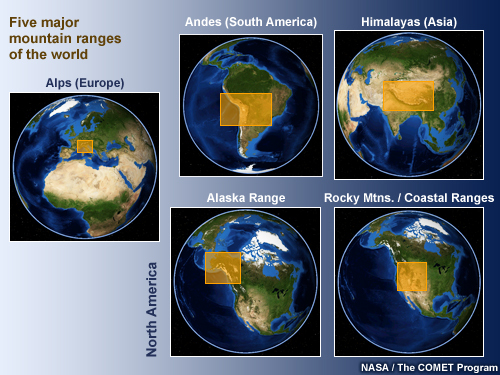 This graphic shows the type of snowpack received by each region of the Northern Hemisphere. As you can see, tundra snowpack covers the largest portion, followed by taiga snowpack. If you live in an area that receives snow, what type of snow does it get? How well does the description match your experience of the area? The table has been expanded to include the depth ranges of the various types of snowpack. Notice that on a global scale, maritime areas receive the deepest snowfalls. Why is this so? Select the correct answers, then click Done. The ocean supplies atmospheric moisture and relatively warm air temperatures that create large snow depths and heavy, wet, high-density snow. Here are the major mountain ranges of the world, all of which accumulate deep, annual snowpacks. We've finished looking at the types and locations of snowpack. Next, we'll examine the global-scale factors that create and impact snowpack. Although maritime areas receive the largest snow events, high-elevation areas at middle and high latitudes (30 to 35 degrees and higher) have the largest average annual snowpacks. Why do they accumulate such deep snowpacks? Select the correct answers, then click Done. As latitude increases, winter temperatures get colder, creating conditions that are conducive to significant snowfall events. The cold temperatures also minimize cold season melting. Note that while some regions are cold enough for snow, they do not receive enough cold season precipitation to establish an extensive snowpack. The polar jet stream defines the path of the strongest midlatitude storm systems, which produce heavy precipitation. On average, higher elevations have colder temperatures. Wind blowing upslope cools. If there's a large elevation gain and the air is sufficiently humid, clouds will form and precipitation will fall. The impact of terrain is clearly evident in this plot of the annual number of days of snow cover for the continental U.S. (CONUS). The areas of greatest annual snowfall coverage correlate with mountain ranges as well as latitude. 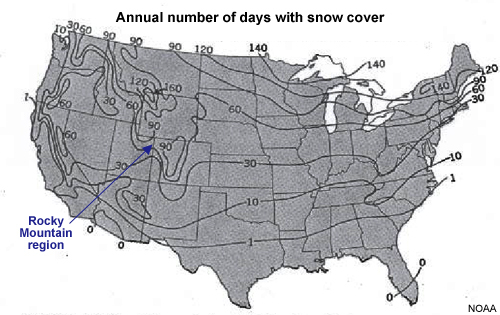 Notice that areas within the Rocky Mountain region of the western U.S. have the most days with snow cover. 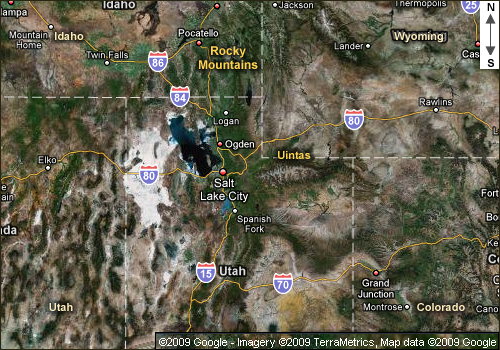 Most mountain ranges in the United States are generally oriented north-south. Which side of these mountains would you expect to receive the greatest annual number of days of snowfall? Select the correct answer, then click Done. Due to the large-scale prevailing west-to-east flow aloft that drives midlatitude storm systems, the upwind (or west in the CONUS) sides of mountains typically receive several times the snowpack depth of downwind sides at the same elevation. 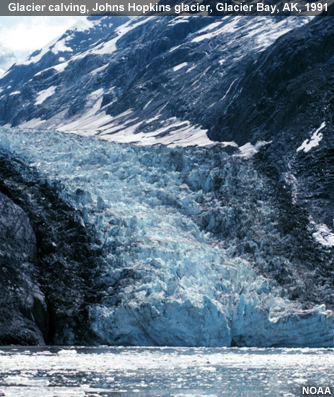 Glaciers are semi-permanent, large masses of ice that form when snow accumulates over time, turns to ice, and starts flowing downhill under the pressure of its own weight. In polar and high-altitude alpine regions, glaciers accumulate more snow in the winter than they lose in the summer from melting and sublimation. As more snow accumulates, air spaces collapse, snow grains recrystallize, and the buried layers slowly grow together to form a thickened mass of ice. This dense ice usually looks somewhat blue. 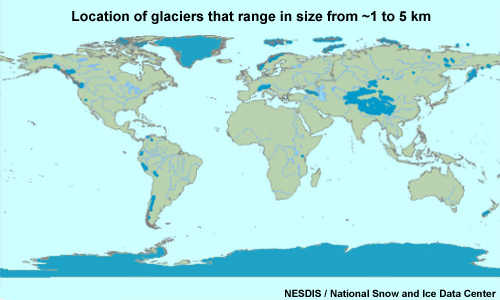 Glaciers are common at high latitudes and in high-elevation areas of the lower-latitude mountain ranges of the Andes, Rocky Mountains, Alps, and Himalayas. At latitudes where snowpack is typically found, the amount of solar energy varies significantly throughout the year. Although the smallest amount of solar energy reaches the Earth's surface in the Northern Hemisphere in late December, snowpack depths peak during late winter/early spring. This is due to two main factors. Snowpack depth does not decrease significantly until melting offsets replenishment by new snowfall. 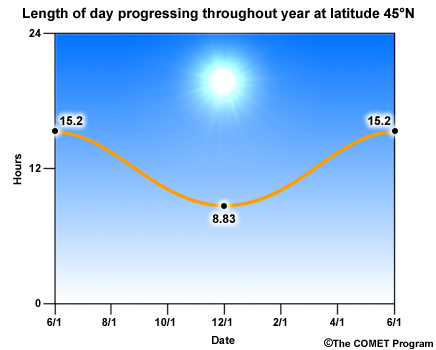 In areas north of the Equator, daytime lengths increase most rapidly during the late March period—the point at which days become longer than nights. On average, this is when daytime melting exceeds new snow accumulation. You might think that the coldest temperatures of the year would correlate with the shortest days. But that's not typically the case. The coldest ground and atmospheric temperatures of the year typically lag behind the winter solstice (December 21 in the Northern Hemisphere) when the minimum solar energy reaches the Earth's surface. That's because the thermal energy stored in the ground from the previous summer and fall delays the coldest temperatures until after the winter solstice. How do we know how much of the world is covered in snow or where the deepest snowpacks are located? While snowpack measurements taken at particular sites provide point-specific data, satellite observations provide global information about snowpack and have revolutionized snowpack assessment on a global scale. For example, they enable us to observe and quantify the percentage of land covered with snow as well as snowpack depths and temperatures around the world. 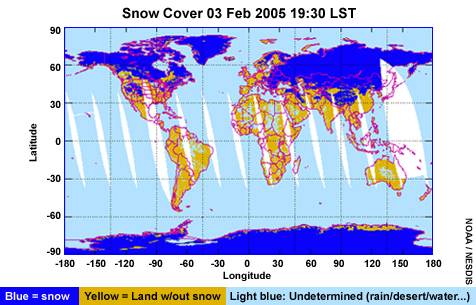 This satellite product shows snow coverage for the Northern Hemisphere in February 2009. For latitudes higher than 40° to 50°, we see that much of the land surface is covered with snow, which is typical for midwinter continental conditions. 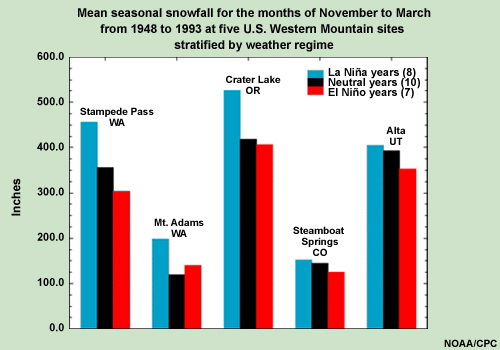 This plot shows how seasonal snowfall amounts vary across sites in the western United States, with striking differences occurring during some ENSO events. The peak times for annual snowfall maxima vary from early to late winter based on factors such as the typical progression of the jet stream, surface storm systems, and moisture sources. For example, the Cascade Mountains receive most of their snowfall in December and January, while the Denver area east of the Rocky Mountains peaks in March. What causes these variations? 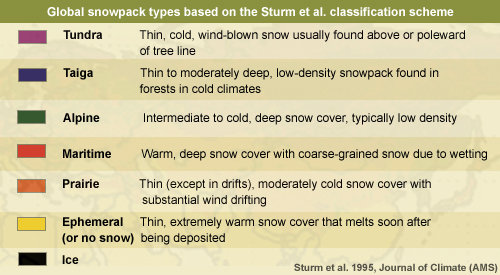 What creates the different types of snowpack found around the world? In the previous section, we examined the global-scale factors that play a role in snowpack development. Now we'll explore the regional- and local-scale factors that have an impact, such as geography, precipitation type, and wind. While large-scale terrain features impact snowpack on the global scale, terrain plays an even more important role in snowpack development and evolution at regional and local scales. Regional topographic features, such as mountain ranges on the scale of tens of kilometers, produce large annual snowpacks due to their influence on the prevailing atmospheric flow. Mountains force the prevailing flow upward, producing moisture-laden clouds that enhance snowfall. 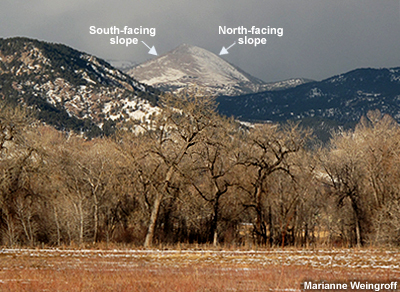 Mountain ranges oriented north-south, such as the Rocky Mountains, enhance snowfall when winds are perpendicular to the mountains (from the west or east). In contrast, ranges oriented east-west, such as the Uintas, have the heaviest terrain-enhanced snowfall with southerly or northerly flow. Terrain is even more complex at the local level, with individual peaks, valleys, moisture sources, and other features creating their own local impacts on snowpack. This results in large horizontal variations in snowpack. In the next few pages, we will examine other factors that impact snowpack development. In this scenario in the Northern Hemisphere, which location is most likely to experience the following: the fastest snowmelt, little snow accumulation due to slope steepness, lots of drifted snow, and the most snowfall from an upslope event? Select the correct answer in the box beside each location. Note that each answer should only be selected once. When you are finished, click Done. For Location A, fastest snowmelt is correct. For Location B, The most snowfall from an upslope event is correct. For Location C, Lots of drifted snow is correct. For Location D, Little snow accumulation due to slope steepness is correct. The answers are discussed in more detail on the next page. Click the highlighted areas in the graphic for more information. Below the graphics are detailed descriptions of each feature. While the sun has a generally uniform effect over snowpack surfaces on flat terrain, it's different in complex terrain. The interaction of aspect (the direction that a slope faces), time of day, temperature, and cloud cover determine how snowpack depth evolves on mountain slopes. In general, in the Northern Hemisphere, south-facing slopes get greater solar exposure, which causes the most frequent and rapid snowmelt, and thus the lowest snow depths. 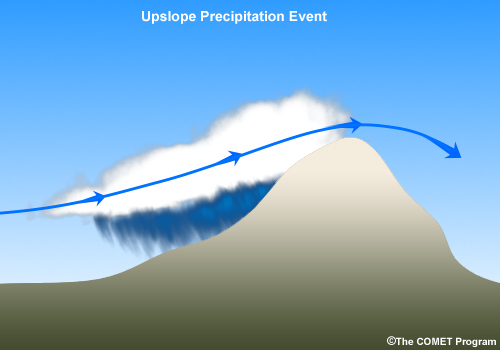 The prevailing wind direction during a precipitation event is critical for the resulting snow accumulation, with the upwind side of a mountain (the upslope side) typically receiving the most snow. Downslope winds tend to dry out the atmosphere and quickly reduce snowfall. Wind has three primary effects on snowfall and snowpack. It fractures snowflakes in the air, breaking them into small pieces of ice that pack together and form dense layers of wind-deposited snow where they land. Wind picks up the top portion of the snowpack, fractures the crystals, and deposits them downwind, increasing snow depth and density where they fall. Wind enhances sublimation, the evaporation of snowpack. When relatively dry air is present, sublimation is always occurring (the top of the pack is always evaporating). Wind enhances the process by quickly removing the water molecules near the ice surface. Note that snow in tree canopies can sublimate particularly quickly due to the enhanced exposure to dry air and wind. In some areas, nearly half of the annual snowfall can sublimate in this way. Here's Spencer Logan of CAIC dicsussing wind and its impact on snowpack: "We're standing in the Front Range of Colorado, where it's very windy. Behind me, you can see the effects of it. Above tree line, we see areas that have been blown bare during the winter, with the snow transported somewhere. Some gets picked up and moved higher into the atmosphere, but a lot of it gets deposited downwind. The big round roll is a very thick deposit of snow, which will probably last through most of the summer." Remember to select the last option, D.
Note that the steepness angle can be as high as 50- or even 60-degrees in maritime climates, such as the coastal mountain ranges of North America. Most avalanches tend to occur on slopes between 30 and 45 degrees. These avalanches are often large and can remove much of the snow from the slope. Avalanches rarely occur on slopes less steep than 30 degrees. 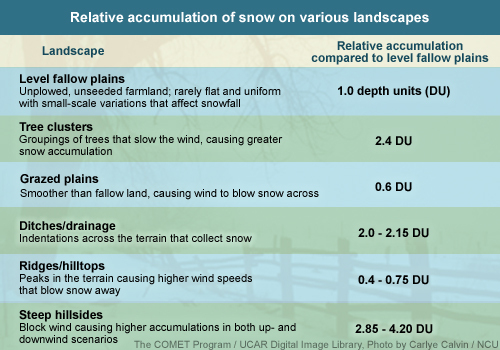 The table describes snowpack accumulation in various settings, with the difference in amounts due largely to wind. Assume that a 10-cm (4-in) snowfall with significant wind occurs over level plains that are fallow; that is, they haven't been planted, plowed, or harvested in a long time. A tree cluster would slow down the wind, with snow accumulations as much as 2.4 times higher than in open areas (up to 24 cm or approximately 10 in). Grazed plains, however, would probably get just over half as much accumulation as the fallow plains. Around twice as much snow would accumulate in ditches and drainages. In contrast, windswept ridges and hilltops would have much lower snowpacks. Wind speeds typically diminish on steep hillsides, with accumulation totals ranging from 28.5 to 42 cm (~11 to 16.5 in). Although geography sets the stage for snowpack development, each type of precipitation event has its own impact on snowpack depth and density. Before examining the precipitation types, we'll take a minute to discuss density. Density is the most important aspect of snowpack since it determines the amount of runoff and the stability of a snowpack. Stability is critical for avalanche considerations. When discussing density, we tend to think in terms of weight per volume, with a typical snow density being 0.1 gram per cubic cm (g/cm3). That makes snow one tenth as dense as water because it is composed of both water and air. When talking about snowpack, we express density as the depth of the pack vs. the depth of the water that would be produced if the snow were melted. This is known as the snow water equivalent or SWE. For example, a snowpack that is 100 cm (39.4 in) deep will melt to produce a volume of water 10 cm (3.9 in) deep. Hydrologists like the term SWE because it tells them how much water will run off when the snowpack melts. Meteorologists typically use another term to discuss the density of snow: snow-to-liquid ratio or SLR. SLR is a unitless ratio of snow depth to liquid depth (SWE). The SLR is the inverse of density, meaning that the higher the SLR, the lower the density of a snowpack. Using our previous example, snowpack with a density of 0.1 has an SLR of 10:1. Assume that you're a hydrologist and want to know how much runoff a particular snowpack will produce. Let's assume that the snowpack has an SLR of 5:1 (meaning that if it were melted, the depth of water would be 20% of the original snow depth). If the snow depth is 20 in (51 cm), how much water is that equivalent to? Select the correct answer, then click Done. 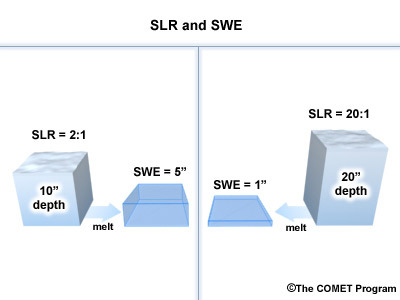 To get the liquid equivalent or SWE, you divide the snow depth (20 in) by the SLR (5:1). In this case, the SWE is four inches. Does a deeper snowpack always produce more water? 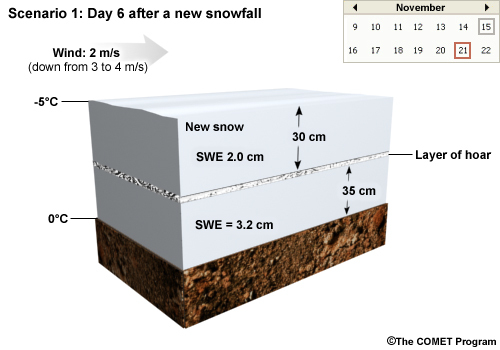 The snow depth on the left side of the graphic is 10 in (25 cm), a dense snowpack with an SLR of 2:1 that would melt down to a SWE of 5 in (13 cm). In contrast, the snow depth on the right is 20 in (51 cm), the SLR for that low-density, fluffy snowpack is 20:1, and the SWE is only 1 in (2.5 cm). The snowpack on the left will produce five times as much snowmelt as the one on the right, even though it's only half as deep. 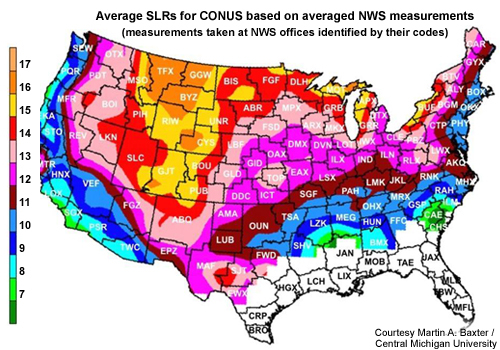 This map shows how average snowpack density values vary across CONUS. The lower SLR values (the wetter, denser snow) correspond to more maritime climates, while the higher values are characteristic of colder and/or higher elevation snowfalls in the interior of the country. Consider these scenarios. Both take place in flat terrain, where it's snowing moderately. In the first scenario, the surface temperature is 30ºF (-1ºC) and it's windy. 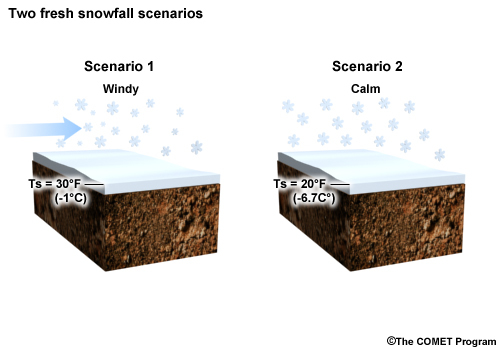 In the second scenario, the surface temperature is 20ºF (-7ºC) and the wind is calm. Which situation would you expect to have higher-density snowpack, all other factors being equal? Select the correct answer, then click Done. Scenario one is likely to have much denser snow accumulation due to the warmer temperature, which enables the air to hold more moisture. When the surface temperature is at or near freezing, the density of new snowfall is usually high. In addition, the stronger wind in the first scenario will fracture the snowflakes prior to depositing them, resulting in packed, denser snowpack. Various types of precipitation impact snowpack: dry snow, wet snow, graupel, sleet (also called ice pellets), freezing rain, rain, freezing drizzle, and drizzle. 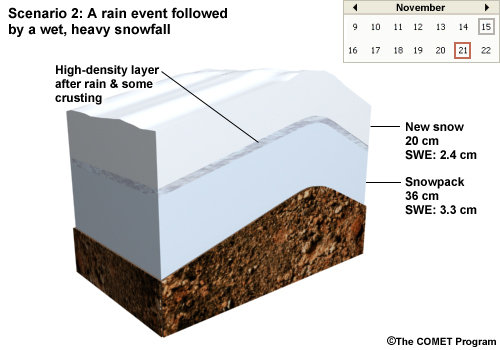 What impact does each precipitation type have on the density and depth of snowpack? Assume that the snowpack is fresh and relatively dense. Select the correct answers in the listboxes for each precipitation type, then click Done for the feedback. b) increases decreases its depth. Dry, low-density snow decreases the density or SWE of a relatively dense pack. It also increases the depth of the pack. Wet snow generally increases both snowpack density and depth. 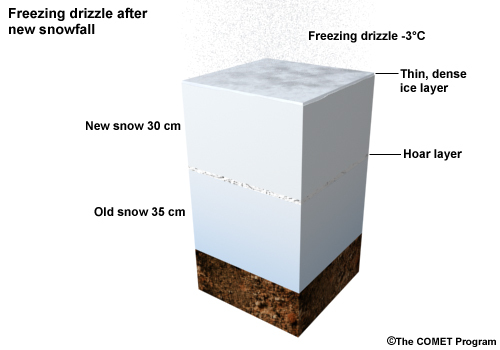 But if a thin layer of wet snow falls on a thin layer of dry snow, the depth could actually decrease due to compaction. Graupel is high-density frozen precipitation that typically increases snowpack density and depth. The high density of sleet causes the underlying snowpack to compact, which decreases its overall depth. As the sleet layer accumulates, it increases the density of the snowpack. Freezing rain freezes upon contact with the snowpack, forming a thin layer of dense, hard ice on top. It typically decreases snowpack depth as its weight causes the underlying snowpack to settle. Note that freezing drizzle has a similar, although less intense, impact as freezing rain. Rain leads to melting and refreezing in the top of the snowpack, which increases the density of the pack. Rain also decreases snowpack depth. Note that drizzle has a similar, although less intense, impact as rain. All snow, be it wet or dry, originates as ice crystals in the atmosphere. 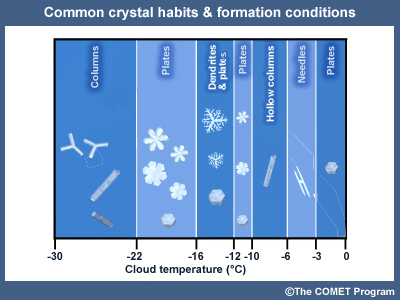 These crystals form different shapes (habits) depending on the temperature and moisture content of the atmosphere. The primary habits are dendrites, plates, columns, and needles. In general, each is produced at the following atmospheric temperatures. Dendrites are the fastest-growing crystals and tend to aggregate into larger snowflakes that result in low-density snowpack at cold temperatures. 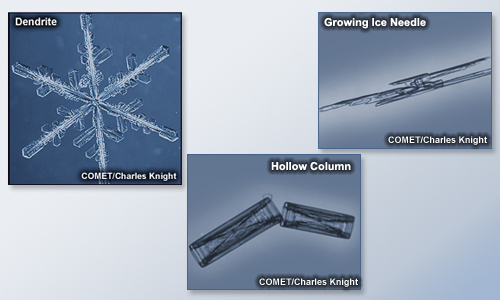 In contrast, smaller crystals, such as columns, needles, and plates, tend to accumulate into a higher-density snow layer. Riming, which occurs when any type of ice crystal passes through a super-cooled cloud (one whose liquid water droplets are below 0°C or 32°F). Rimed crystals are partially or completely coated in tiny frozen water droplets and are associated with higher-density snow accumulation. The presence of broken crystals. Crystals can fracture when they hit each other as they descend through the atmosphere or when they strike the ground. Higher winds lead to more fractured crystals, which increases snowpack density. For more information on atmospheric microphysics, see the COMET module “Topics in Precipitation Type Forecasting” at http://www.meted.ucar.edu/norlat/snow/preciptype/. Snowpack evolution is often referred to as snowpack metamorphism. 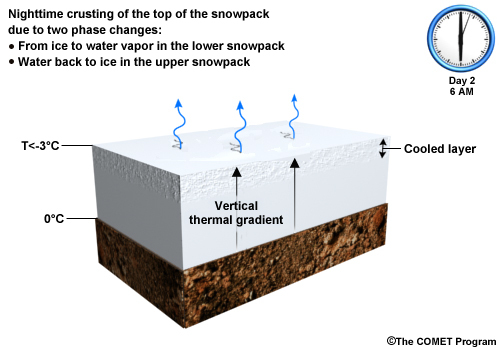 The characteristics of a snowpack, such as its depth, density, layering, degree of bonding, and temperature, change over time regardless of whether more precipitation falls. Metamorphic processes become more important as dry periods persist. 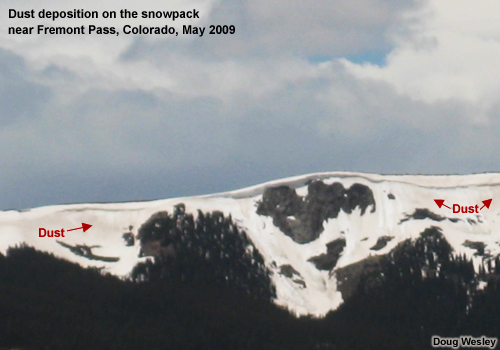 Our study of snowpack evolution spans three sections. Before getting started, we need to define some terms. 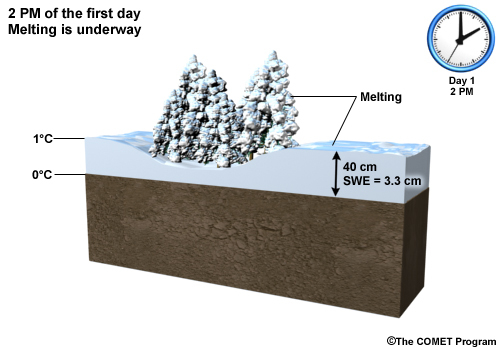 Snow grains refer to the ice crystals within a snowpack rather than those in the atmosphere. Bonding refers to the degree to which grains are aggregated (clustered together) or not. For new snowfall, the degree of bonding is generally greater if the crystals are of similar sizes. 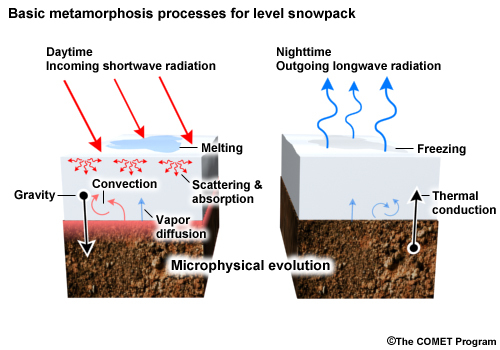 The basic metamorphism processes that affect snowpack evolution are gravity, conduction, radiation, vapor diffusion, and, to a lesser extent, convection. We’ll describe each process on this and the following pages of this section. In general, gravity acts to pull snowpack straight downward toward the ground on flat slopes. It increases the density of the snow after the snowpack becomes established in a process called settling. Over sloped surfaces, a portion of the gravitational force is directed parallel to (along) the slope rather than vertically. This portion increases with slope steepness and is responsible for moving snow downhill. Conduction is the direct transfer of thermal energy from warmer to cooler substances that are in contact with each other. Conduction is present in snowpack when there are changes in temperature within the pack or at the top or bottom. Conduction often occurs in fall when ground temperatures are warmer than the snowpack. A temperature gradient forms, causing the ground to heat the lower portion of the snowpack. Note that ground temperatures just below the snowpack are typically near 0°C except in permafrost regions of the high latitudes, where they can be significantly colder. In these areas, snowpack temperatures more than a few centimeters away from the ground can be as low as -60°C depending on the ambient air temperature. Radiation is primarily responsible for inducing the melt/freeze process, which results in crusting and other types of crystal evolution. Two types of radiation are important for snowpack evolution. Solar energy reaching the Earth's surface is reflected, absorbed, or scattered, depending on the type of surface. Snowpack is particularly reflective, especially when the top of the pack contains newly fallen snow. The degree of a surface's reflectivity is referred to as its albedo or ratio of reflected solar energy to incoming solar energy. 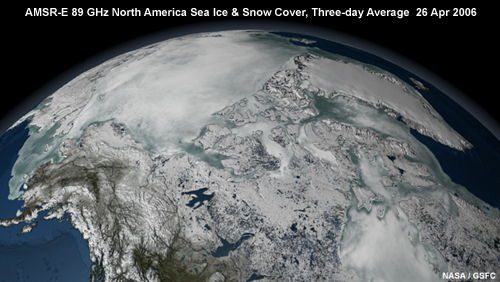 The albedo of snow is relatively large—typically in the range of 0.3 to 0.9. This means that 30% to 90% of the energy is reflected back to the atmosphere. The albedo depends largely upon the age of the snow at the surface, with old snow having lower albedos than new snow: 0.3 to 0.5 as compared to 0.6 to 0.9. That's largely due to the presence of foreign matter such as dirt and dust, which are less reflective and have lower albedos. Albedo is also dependent on the size of the crystals in the top of the snowpack, with smaller crystals having larger albedos. All surfaces on Earth, be they bare ground or snowpack, constantly emit infrared radiation. The amount is primarily controlled by factors such as the temperature of the surface and the presence of nearby or overhanging vegetation. 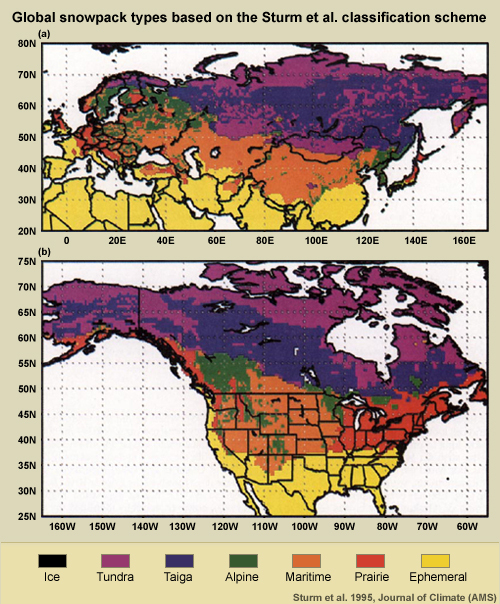 For snowpack, the warmer and more vegetation-free the surface, the greater the rate of radiative loss. This cools the snowpack at the very top few mm of the surface. Contrast this with the warming effect of incoming solar radiation, which heats up the top 15 to 30 cm (6 to 12 in) of snowpack. On a calm, clear night, a snow-covered surface will cool much more quickly than a bare one given the same surface temperatures. That's due to several factors. 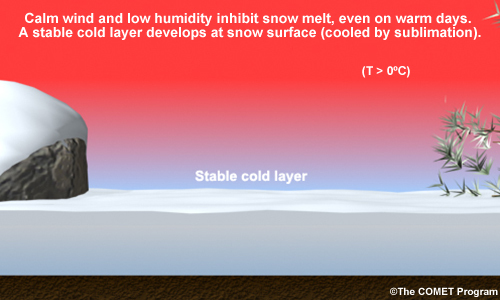 Even though both surfaces have the same temperature at sunset, the snow radiates heat very efficiently, increasing the rate of heat loss at the surface. Snow is also a very good insulator. This prevents heat from rising through the snowpack, which allows the surface to cool quickly. 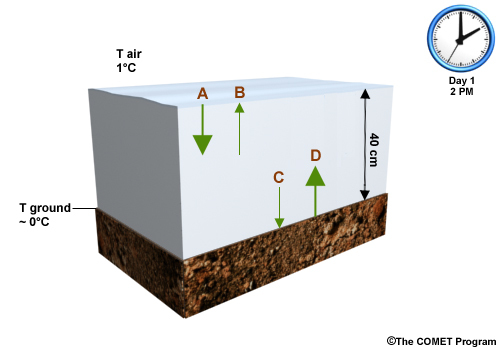 In contrast, bare soil conducts much more heat upward from below, which helps slow down cooling at the surface. Radiation and conduction are processes that transfer thermal energy. Each induces changes in snowpack between solid ice, liquid water, and water vapor. Melting is a phase change from solid ice to liquid water. As ice melts, it absorbs a great deal of energy from the surrounding environment, which significantly slows the warming of the snowpack. 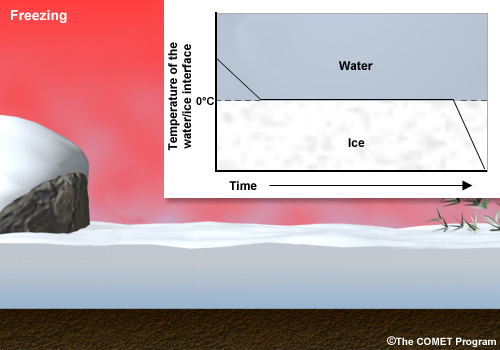 As a result, the temperature rise in a warming snowpack stalls at 0°C (the melting point) as ice changes to water. Freezing is a phase change from liquid water to solid ice. As water freezes, it actually releases heat, which significantly slows the cooling of the snowpack. Sublimation is a phase change from ice directly to water vapor. It occurs most commonly and quickly at the surface of a snowpack on dry, sunny days. 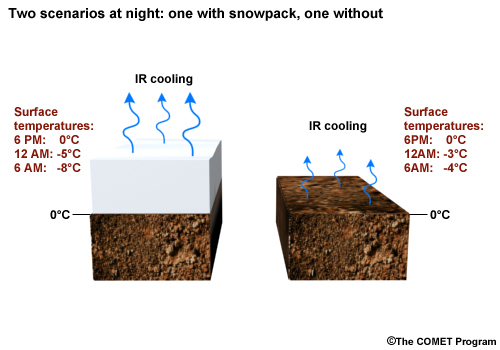 Sublimation absorbs much more energy from the surrounding environment than melting, creating a shallow, stable layer just above the snowpack. This occurs despite the sunny conditions and inhibits the melting of the pack. Now we'll discuss the important process of microphysical vapor diffusion, which is critical for snowpack evolution. This simple schematic shows how ice molecules move within a snowpack when the ground is warmer than the snowpack. The process involves millions of ice and water vapor molecules. 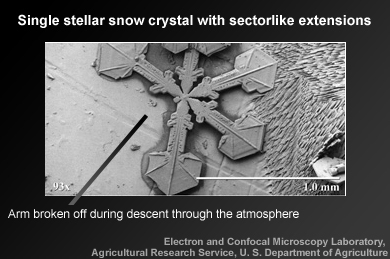 Snow crystals (snow grains) are interspersed with microscopic air pockets. These air pockets have a given temperature and vapor pressure (the part of air pressure that's due to water vapor). The air at the bottom of the pockets is warmer than that above since it's closer to the (warmer) ground. This results in temperature and vapor pressure gradients. As the animation below shows, the water molecules move from high to low vapor pressure by sublimating off the snow grain at the bottom of the pocket and moving upward and attaching onto the snow grains at the top. This involves changing from vapor back to ice, a process called vapor deposition. The result is that the upper snow grains grow at the expense of those below, resulting in a net transport of ice mass upwards. The process is reversed when the ground is colder than the snowpack (an unusual situation). In the lower portion of the snowpack, convective processes, albeit weak ones, can be important if the snowpack is relatively porous. We see this with Arctic snowpack that has evolved over days and weeks into very porous layers of snow grains. The convection is caused by warm air at the bottom of the snowpack rising into the porous layers above. The rising motion can extend over a meter upward depending on the depth of the pack and the porosity of the layers. The primary effect of convection is to transport small amounts of heat upwards. This section uses a scenario to explore snowpack evolution in flat terrain. The scenario begins on November 15 in a region of flat, open terrain with some areas of vegetation. The area sits at an elevation of 2.5 km (8,202 ft) and latitude of 45°N. (You could find this kind of place in Wyoming.) The area was free of snow when it experienced a significant snowstorm last night. It's now sunrise, which we'll say is 6:00 am local time. The snow has stopped, skies are clear, and there are 40 cm (15.7 in) of fresh snow on the ground. The temperature at the top of the snowpack is -3°C (27°), and the ground temperature is 0°C (32°F). 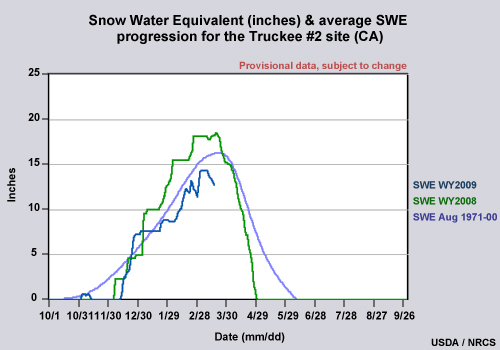 The water content of the snowpack (its SWE) is 2.9 cm (1.1 in). Given the relatively dry snow, what crystal habits and sizes would likely comprise most of the snowpack? Select the correct answer, then click Done. The snow-to-liquid ratio is approximately 14:1 (40 divided by 2.9), which is generally considered an average to slightly-below-average SLR for this elevation. Due to the low density, we can infer that the majority of the snowfall consists of dendrites and aggregated dendrites. Small and rimed crystals have a lower SLR and result in denser snow. 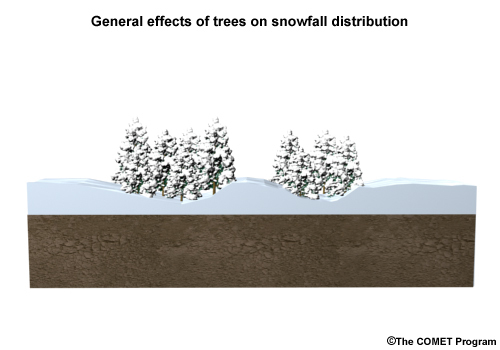 Vegetation has a strong influence on the initial snowfall distribution and its subsequent redistribution, with more snow accumulating in clearings than in adjoining forests. How much more snow would you expect to accumulate in clearings than in treed areas? Select the correct answer, then click Done. The ground in treed areas receives 20 to 45% less snow than in adjoining clear areas primarily because of the interception by tree branches. But the size of the clearing is important too. If it's larger than the height of the trees, the area can become windswept, with the windblown snow accumulating in the forest. Note that when the snow on forest floors is untouched by the sun and wind, it's less prone to subsequent sublimation. Vegetation can have a large impact on snow. During precipitation events in winter, snow collects on the ground as well as on pine boughs. Because of the wind, the snow on the boughs densifies, temperatures change, and snow sheds and forms a moat around the trees. There's much denser snow next to the trees than in open areas. If the snow on the pine boughs melts onto the pack, it changes the properties of the snow surface. The pine needles also add contaminants to the snow, changing its albedo. In addition, the trees can be a source of energy for the snowpack. Since they're much warmer than the surrounding environment, we can get lateral temperature gradients around the trees. The trees also act like terrain features in regard to the wind, causing drifts around vegetation stands and small tree clumps. Since we're in late autumn and approaching the winter solstice, the daytime solar energy is near its annual minimum. The solar energy heats the upper snowpack surface relatively slowly throughout the middle part of the day and begins melting the snow around noon. What is the albedo of the snow likely to be in the early afternoon? Select the correct answer, then click Done. The clear skies and fresh snow result in relatively high albedos, probably in the range of 0.7 to 0.8. This means that 70 to 80% of the solar radiation is reflected back to space. Aspect is the direction that an object or tilted ground surface faces. We're looking at a large tree stump covered in snow. Notice the dramatic melting on the south-facing side and the undisturbed snowpack on the north-facing side. The snow on the dark, cold side remains as it was when it fell, whereas a melted layer has formed (and subsequently crusted) on the south-facing side. To what approximate depth does the sun heat the snowpack at 2PM? In which direction is a thermal gradient created? Select the vector corresponding to the correct strength and direction of the gradient, then click Done. Note that the vectors point from cold to warm, with their widths representing the strength of the gradient (strong vs. weak). Since we're in late autumn near the winter solstice, the upper snowpack surface will melt relatively slowly. The melting will last a few hours each day if atmospheric conditions remain calm and clear. This means that the thermal gradient is small and is directed upward. Recall that with new snow, solar radiation will warm 15 to 30 cm (6 to 12 in) of the top of the pack. Conduction began when the snow started accumulating. At sunrise, the temperature was 0°C (32°F) near the base of the pack and -3°C (27°F) at the top (the same as the air temperature above). This caused a small temperature gradient, with the snow next to the ground warming slightly from conduction. This process will continue as long as the adjacent ground surface stays warmer than the snowpack. In the early evening, radiative cooling quickly takes over and the top of the snowpack cools very quickly. In contrast to solar absorption, the vast majority of radiative loss happens within a few millimeters of the top of the snowpack. In our case, since the outgoing radiative loss is much larger than the daily solar radiative gain, nighttime temperatures at the top of the snowpack are much lower now. What happens to the very top portion of the snowpack, which melted earlier in the day? Select the correct answer, then click Done. Melting will stop because the surface temperature of the snowpack falls well below freezing after sunset. Crusting (the freezing of the snowpack surface) occurs quickly around sunset. What would you expect to happen to the temperature gradient in the upper portion of the snowpack during the night if atmospheric conditions are clear and calm. Select the vector that corresponds to the correct strength and direction of the thermal gradient, then click Done. Note that the vectors point from cold to warm, with their widths representing the strength of the gradient (strong vs. weak). Radiative cooling will maximize as the evening progresses. The top few millimeters of the snowpack will cool very rapidly, resulting in a strong temperature gradient directed downwards. The intense vertical thermal gradient present the next morning (day two) has transported moisture from lower down in the snowpack to the top layer, causing the ice grains in about the top 5 cm (1.9 in) of the snowpack to grow. 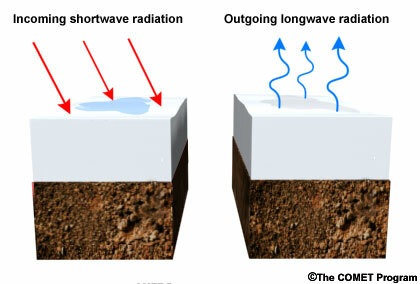 This process, known as radiative recrystallization, involves two phase changes: one from ice to water vapor in the lower snowpack, the other from water vapor back to ice in the upper snowpack. Some of the water vapor particles moving up through the snowpack escape into the atmosphere right above the pack and freeze upon contact with the colder air temperatures. This results in the formation of surface hoar at the top of the pack. Surface hoar is large, rounded, feathery crystals (snow grains) with flat edges that grow rapidly. Gravity is always at work, causing snow depth to decrease over time. As the snowpack ages or settles, its density gradually increases, which generally makes the snowpack more stable. Gravity never works in isolation. Other processes, such as wind events and precipitation, often have a more dramatic effect on snowpack density and stability. Note that when we mention stability in the context of snowpack, we're really talking about the likelihood of avalanche formation. A stable snowpack is less likely to fail and form an avalanche. Long, undisturbed periods of cold atmospheric temperatures and radiative loss at the top of the snowpack have a cumulative effect, with most of the snowpack steadily cooling. Since the ground remains relatively warm because it's insolated by the snow, the temperature gradient increases. If it gets large enough, depth hoar can form. Depth hoar is highly faceted, large, feathery crystals that grow on the edges of existing snow grains. These electron microscopy images show depth hoar crystals, first at a very small size (a few tens of micrometers), then at a large, mature size. Notice that the depth hoar grows at the expense of the pre-existing snow grains. Depth hoar typically forms over several days. Although the crystals are bonded, together they form a weak, brittle structure. If you try to pick up or move a layer dominated by depth hoar, it will disintegrate. Note that weak layers of depth hoar are a significant concern from an avalanche perspective, since they can be the source of fractures and slides. It's been six days since the initial snowstorm. How would a wind storm, a dust storm, another snowfall, and other types of precipitation events impact the snowpack? We'll see what happens, returning to day six at the outset of each event so we can examine its impact on the same set of conditions. A windstorm sweeps through the area six days after the initial snowfall, with speeds up to 18 m/s (35 kt). Before we examine its impact on the snowpack, we'll take a general look at wind and snowpack. 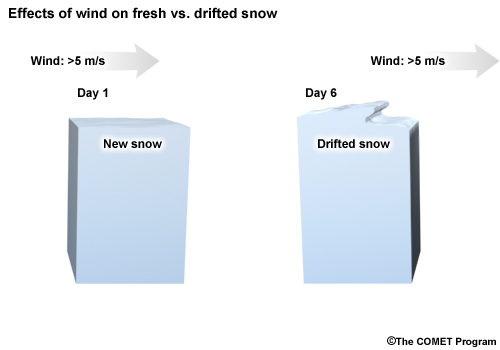 Wind can transport snow when wind speeds are above ~5 m/s (~10 kt). 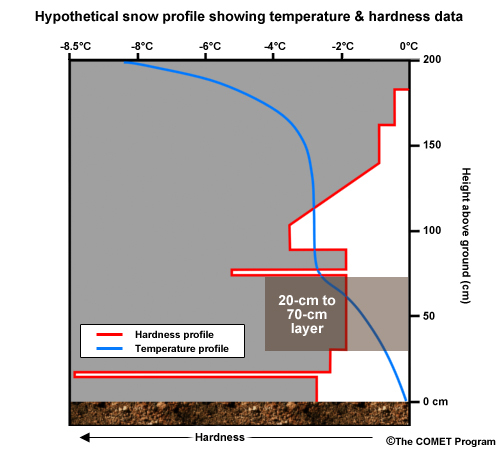 This threshold depends on the characteristics of the snow surface though. Weaker winds can move low-density snow whereas older, hardened snow surfaces may only begin to move with much stronger winds. Which snowpack would be impacted more by winds greater than the 5 m/s (~10 kt) threshold? Select the correct answer, then click Done. Drifted snowpack is harder to lift and move because the snow grains are typically fractured, smaller crystals. As they accumulate, they pack together more tightly, making them more resistant to wind. For a given wind speed, the denser the snowpack, the less the snow will be blown and redistributed. Six days after the initial snowfall, a dust storm sweeps across the region. Dust storms are created by very strong low-level winds moving across arid regions. The dust moves downstream in the atmosphere and resettles on snowpack when the wind speed decreases or the dust particles are scoured out by precipitation. Scouring is a process in which precipitating ice or water particles collide with other airborne particles, such as dust. These particles are carried along with the precipitation down to the ground. As you can see, dust discolors the top of snowpack. What impact would you expect this to have on the albedo of the pack? Select the correct answer, then click Done. If the dust is not covered by additional clean snow, it will significantly reduce the albedo of the snowpack, causing the top of the pack to melt significantly during daytime. In fact, general springtime snowmelt speeds up significantly when “dirty” snow is present. Dust deposits on snowpack become a layer—first at the top of the snowpack and then submerged if additional snow falls. When the dust is in the top layer, the decrease in albedo accelerates melting. As melting proceeds, the dirt remains on top and merges with any previously established dust layers to form one strong, thick dirty layer. Furthermore, the dust embedded within the snowpack can induce internal melting and freezing. The resulting internal layers may exhibit a reduced degree of bonding that can affect snowpack stability in mountainous regions. We've just received approximately 12 in (30 cm) of new snow. What are the most important impacts of the new snowfall on the snowpack? Select the correct answer(s), then click Done. Option A is incorrect because the wind speed is below the 5 m/s (10-kt) threshold for drifting. Option B is incorrect because depth hoar originates within the snowpack, not on top. Option C is incorrect because the new snow is relatively dry and lighter than the old snow (the SLR is 15:1 compared to ~10:1). Option D is correct because although the new snow is relatively light, it's deep enough that the additional weight will likely compact the old snow even further. Assume that the SWE of the new snow is 1.6 in (4.0 cm) rather than the 0.8 in (2.0 cm) that we just discussed, making it a very dense, wet snow layer. This type of snow tends to develop with warmer atmospheric and surface temperatures. Higher-density snow overlying lower-density snow can lead to an unstable snowpack, one prone to collapse, since the bonds in the lower layer may not be strong enough to withstand the additional weight. Unstable snow situations occur in flat areas all the time but do not lead to avalanches due to insufficient slope steepness. When the density of the snow increases during a single snow event, we get an upside-down snow situation. Generally speaking, the higher-density layer is stronger than the lower-density layer. 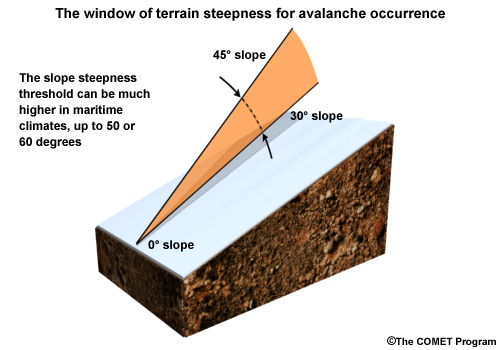 In flat areas, the denser, upper layer speeds the compaction of the lower layer, but on a steep slope, the situation can lead to an avalanche. Consider what would happen if the following precipitation events occurred after the second snowfall: rain, freezing rain, sleet, freezing drizzle, and graupel. What immediate impact would each type of precipitation have on the snowpack? Select the correct answer in the box beside each statement. When you are finished, click Done. Note that each precipitation type only matches one statement so it should only be selected once. Rain creates a wet snow layer in the top few cm of the snowpack. Freezing rain adds a very high-density layer of ice to the very top of the snowpack. Freezing drizzle adds an ultra-thin, high-density layer to the top of the snowpack. Graupel accumulates as a layer of dense particles on the top of the snowpack. Each option will be discussed in more detail on the next page. Click on each type of precipitation to learn more about it. Freezing rain accumulates as a very dense, hard layer of ice on top of the snowpack. Graupel acts as a very dense, heavy layer of particles, which can compact the top of the old snow. When graupel is buried, it is a weakly bonded layer. Freezing drizzle accumulates as an ultra-thin, very dense, hard layer of ice on top of the snowpack. Sleet accumulates as a dense layer on the top of the snowpack and compacts the top of the old snow layer. Raindrops percolate into the top few cm of the snowpack, creating a wet snow layer. The mixture will eventually freeze when temperatures fall. When crusting occurs, the associated heat release caused by the freezing produces a temperature gradient in the snowpack and facets grow on the snow crystals just below the crust, forming flat edges. If snow falls after that point, we'll have a buried layer of faceted crystals next to a hard ice layer, which could lead to cracking and collapsing in the new snow layer. We've skipped forward to March. An upper ridge (a high-pressure system associated with clear, dry weather) has developed in the atmosphere. Daytime temperatures are in the +3°C to +8°C range (37° to 46°F). Since that's above freezing, significant melting is occurring on the top of the snowpack. The warmer the atmospheric temperature, the greater the rate of melting. In general, melting adds liquid to the top of the snowpack, which increases the density of the upper layer. The vast majority of liquid from melting or rain moves down through vertical channels in the snowpack unless it encounters an ice layer, in which case the water will pool above it, freezing if temperatures fall. If atmospheric temperatures stay warm, the water will keep moving horizontally until it finds another vertical channel. 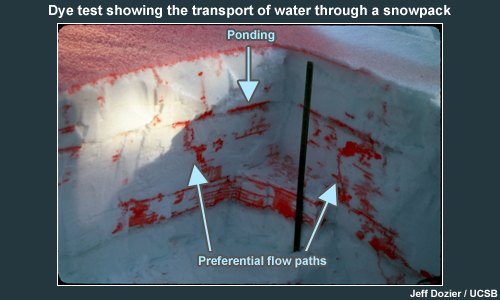 If the water encounters a capillary barrier, it will move parallel to the snow layers rather than through them. A capillary barrier forms when a layer with small pore spaces rests above one with large pore spaces. The gradient in pore sizes creates a barrier that the water runs along. At night, when the air temperature falls back below freezing, the top layer freezes into a crust whose density is near that of water (many times higher than snowpack). The latent heat release from the crusting process enhances temperature gradients within the snowpack. This can lead to edge growth (faceting) on the snow grains and create layers of reduced stability. The cycling of melting and freezing can occur diurnally or with the passage of storm systems that are common during the spring season. In the spring (and early summer at higher elevations), snowpack coverage typically becomes spotty. Melting accelerates at the bottom fringes of the snowpack due to conduction from the adjacent warmer, bare ground. Rain falling on the snowpack is inherently warmer than the pack and provides additional energy for melting, which accelerates the melt process. No land mass is perfectly flat. Areas with just a slight slope are prone to flooding from excessive snowmelt. If the land under the snow is frozen, it cannot absorb much water from the snowmelt. The water will travel downhill even if the slope is minimal and can lead to flooding. This scenario takes place in mountainous terrain rather than the flat terrain of Scenario 1. How would you expect snowpack evolution to differ in the two scenarios based solely on the difference in terrain? For each process or event, select the correct answer, then click Done. a) Gravity has more less impact in mountainous than flat terrain. Gravity has more impact in mountainous than flat terrain. Gravity has a greater impact in sloped situations since it can cause layers to detach and slide. Note that gravity causes snowpack to settle faster in flat terrain. b) Snowpack in mountainous terrain has more fewer the same number of layers than flat terrain. Snowpack in mountainous terrain has the same number of layers than flat terrain. Sloped surfaces do not necessarily add to or subtract from the number of layers. c) Snowpack instability has more less impact in mountainous terrain. Snowpack instability has more impact in mountainous terrain. Snowpack is often unstable in both flat and sloped terrain but the impacts are far more severe in mountainous areas. Just think of slides and avalanches. d) Precipitation distribution usually has a uniform varied impact in mountainous terrain. Precipitation distribution usually has a varied impact in mountainous terrain. Terrain has a huge impact on precipitation distribution. 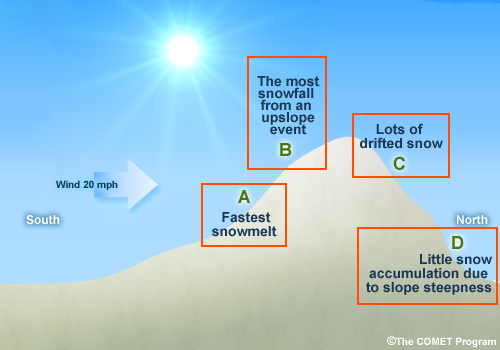 Terrain features affect the type and amount of snowfall, with upwind slopes (upslope areas) typically receiving more precipitation than other slopes. Precipitation distribution is typically more even in flat terrain, especially in areas well away from mountains and large bodies of water. e) Winds have a greater a lesser the same effect in mountainous terrain. Winds have a greater effect in mountainous terrain. 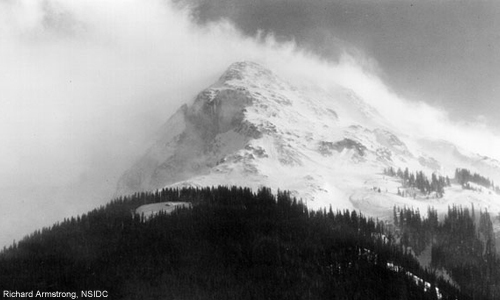 Snow redistribution from wind events can create unstable conditions over sloped terrain. For example, drifting snow can create cornices on the lee side of ridge lines that can become so deep that they fracture, causing an avalanche. Recall that drifted snow is much denser than non-drifted snow. Assume that a similar sequence of meteorological events occurs in this scenario as in the first one. Snow falls on bare ground on November 15, followed by several clear, calm nights. Like Scenario 1, this initial snowfall brings 16 in (40 cm) of new snow, with the surface temperature at -3°C (27°F) at the end of the storm. The SWE is 1.3 in (3.3 cm equivalent) and the SLR is 12:1. This scenario is also at 45°N latitude. Then four more weather events occur, followed by springtime melting. As in scenario 1, we will treat the four events as if they occur independently of each other, not in consecutive order. 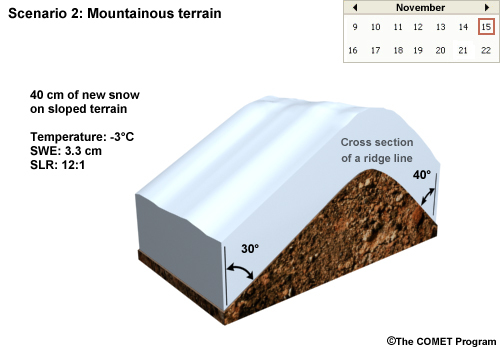 We are going to focus on a ridge line whose slopes are 30 and 40 degrees respectively. Because of the slopes, we have to consider snowpack movement, which involves several important factors. These include gravity, friction, and deformation, which we'll explore on the following pages (before the additional weather events occur). Gravity causes avalanches to occur on sloped but not flat terrain. We'll use these graphics to see why. Like all forces, gravity can be described in terms of vectors, with the gravity vector drawn to indicate the direction of its pull. The total gravity vector remains constant. In flat terrain (A), gravity pulls the snowpack straight downwards towards the ground. There are several important relationships between the two components. The component that's parallel to the slope increases as the slope steepens. Conversely, the component that's perpendicular to the slope decreases as the slope steepens. When the slope is vertical (E), the slope-perpendicular vector is reduced to zero so all of the gravitational force is directed parallel to the slope. Avalanches form on slopes mild enough for snow to accumulate but steep enough for it to slide. Generally, this includes slopes between 30 and 45 degrees, although the slope threshold can be as steep as 60 degrees in maritime climates. Every slope has a limit as to how deep the snowpack can be without sliding. That limit decreases as steepness increases, meaning that the steeper the slope, the less snowpack it can hold. If a slope is too steep, snow will not accumulate significantly so the slope will remain bare. 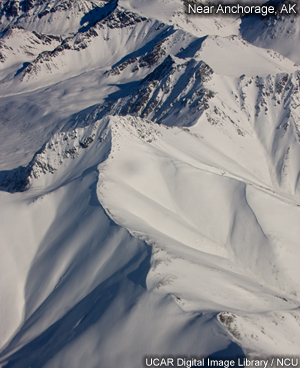 Different types of avalanches form depending on the characteristics of the snowpack. These include slab, point-release, slough, wet, and dry avalanches. 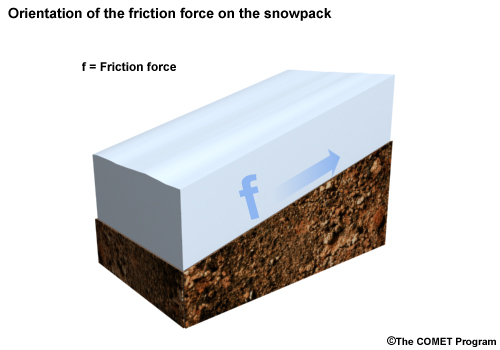 Friction inhibits the movement of the snowpack at its interface with the ground and is always directed parallel to the slope. However, its orientation is directly opposite that of the slope-parallel gravitational component. Frictional resistance increases as surface roughness increases. 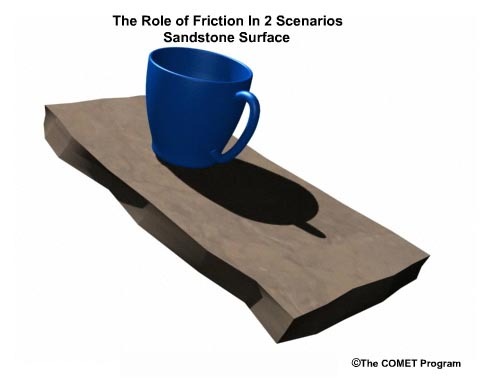 Friction is the primary factor that lets snowpack build up on sloped surfaces, rather than just sliding downslope. To illustrate this, imagine a plane of glass with a coffee mug on it. You don't have to tilt the glass much to get the mug to slide off. The glass is very smooth and produces little frictional resistance. If you change the glass to a sandstone surface, you'll have to tilt it much higher to get the same effect. This is due to the rough surface of the sandstone, which inhibits objects resting on it from moving due to its high frictional force. 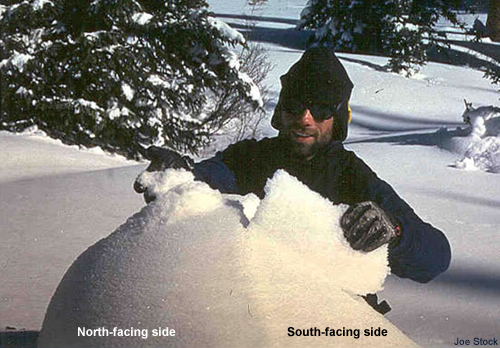 Many people think that snowpack behaves as a solid mass, unable to stretch, compress, or bend. In fact, snow is a viscoelastic material, meaning that an entire snowpack or particular layer can shear and stretch. Understanding this is important when assessing the stability of a snowpack. Layers form in a snowpack from the various snowpack processes that we've discussed, including thermal gradients, melting/freezing, radiative processes, and precipitation events. 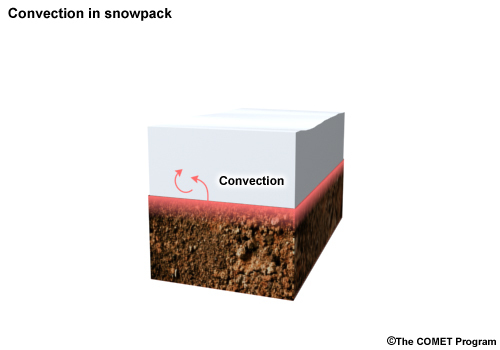 Layers can represent weaknesses in the snowpack because fractures tend to occur along their interfaces. Which of the following grain types commonly form persistent weak layers within a snowpack? Select the correct answers, then click Done. Depth hoar and other faceted grains have edged, flat surfaces. These grains inherently form weak layers that can reduce stability over long periods of time. The other types of grains, such as pristine snow crystals, do not last very long or form strong, well-bonded layers. Note that if a strong layer overlies a weak one, the situation can be unstable. We've examined the factors that characterize snowpack in complex terrain. Now we'll see what happens when additional atmospheric events occur: a wind storm, a dust storm, another snow event, and a rainstorm, all of which lead to a layered snowpack. Remember that layers are a primary determinant of the stability of a snowpack in regard to avalanche formation. Multiple events can create snowpack layers of varying densities, which can lead to unstable conditions. As in Scenario 1, we'll treat the four new precipitation events as if each one occurred several days after the initial snowfall rather than in consecutive order. This will let us examine the effect of each event on the same set of conditions. Then we'll skip ahead to March, when springtime melting begins. 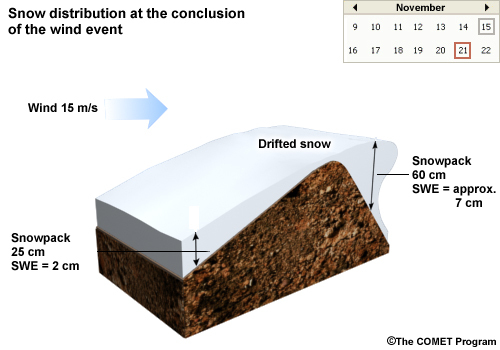 Six days after the initial snowfall, a 15-m/s (30-kt) wind event occurs, which lasts twelve hours. In general, wind can significantly redistribute snowpack in the mountains where high wind speeds are common. 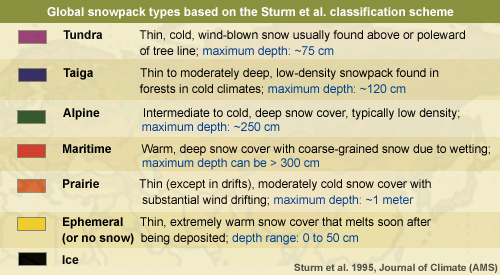 With wind speeds of 15 m/s, snow depths can be at least 50% higher in redistributed areas. The depth is typically greatest on the lee or downwind side of a ridgeline. 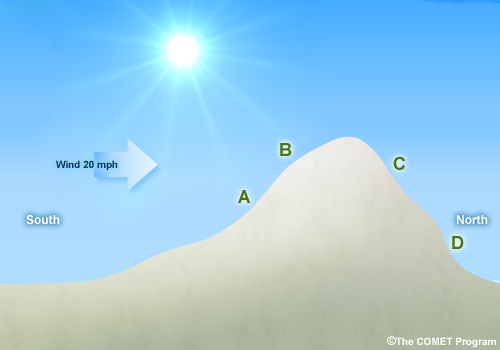 The location of the maximum is typically dependent on the wind speed, with higher speeds usually corresponding to distances further downwind from the crest. When wind redistribution occurs relatively quickly (on the order of several hours), it produces stress that a formerly stable snowpack may not be able to resist. The quickly added weight may lead to an avalanche. 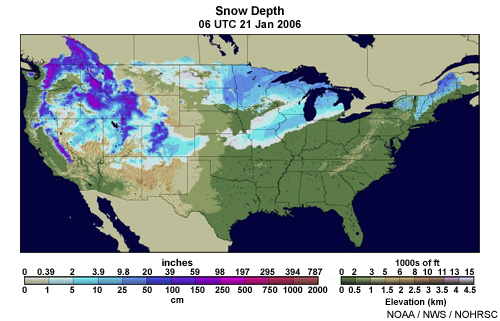 Redistributed snow is inherently of higher density than undisturbed snow. When it accumulates on low-density snowpack, it forms a slab. The slab increases the weight of the snowpack, to the point where it may exceed the counteracting force of friction. When this occurs, the slab can fail, causing an avalanche. If subsequent snowfall covers redistributed snow, high-density layers will be created within the pack. Let's see what happens if the initial snowfall is followed by a high wind event that deposits dust on top of the snowpack. If the dust layer is covered by new snowfall, it will become internal to the snowpack. What impact might this layer have on the pack's stability? Select the correct answer, then click Done. The initial 16-in (40-cm) snowfall had an SLR of 12:1, which has probably decreased to about 11:1 in the six days following the event. Then we get 8 in (20 cm) of wet, heavy snow, with an SLR of 8:1. What impact might the new layer of wet, heavy snow have on the pack's stability? Select the correct answer, then click Done. Since the lower portion of the snowpack is six days old, it has had time to evolve and could well contain depth hoar (a weak layer). The added weight of the new, heavy snow poses a risk that the weak layer may fracture or collapse. 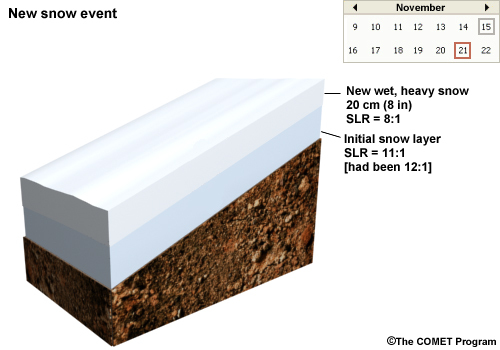 What would happen if the original snow layer was much drier—if the SLR was at least 15:1? If the slope was steep enough, inconsequential, point-release avalanches would probably occur after the initial snowfall. Then, with the addition of the second, heavier snow, the top slab would be even more likely to slide, creating a larger, heavier, and longer avalanche or slide. Let's say that in the six days following the initial snowfall, the original 16-in snowpack became slightly denser while its depth decreased slightly. The SLR was about 11:1. Then the surface temperatures warm, a storm approaches, and significant rainfall occurs. Most of the rain (about 0.2 in or 0.5 cm) occurs at 36°F (2°C). The top of the snowpack is transformed into a high-density layer, with some crust forming after the rain and the passage of a cold front. As is typical in mountainous locations, snow falls after the cold front passes and is wet and heavy, with a liquid equivalent of 2.4 cm (1 in) and an SLR of approximately 8:1 to 9:1. Now we have a relatively thick layer of crust and high-density snow that's 20 cm (8 in) down in the pack. Snow grains in the crusted layer have a low degree of bonding, so the presence of this weak layer can decrease friction, thereby reducing the stability of the snowpack. It's now March and springtime melting has begun. Melting produces liquid in or on the top of the snowpack, which is pulled along the slope or down through the pack by gravity. The rest of the process is similar to that described in the flat land scenario. Let's look at the impacts of snowmelt. For each statement below, decide if it is right or wrong, then click Done. Melting increases the potential for flooding. The correct answer is a, true. Snowpack runoff can cause flooding depending on the amount and capacity of the drainages. Melting decreases stability at layer interfaces that have refrozen during cold periods. Layer interfaces can become liquid paths and subsequently freeze at night or during cold periods. These crusted layers may lead to significant hoar formation over long periods of time due to local temperature gradients. Melting warms the atmosphere, which can subsequently accelerate the rate of snowmelt. The correct answer is b, false. Melting actually cools the atmosphere near the snowpack. If this latent cooling didn't occur, the snow would melt even more quickly. Here are comments by Ethan Greene about snowpack stability in springtime. 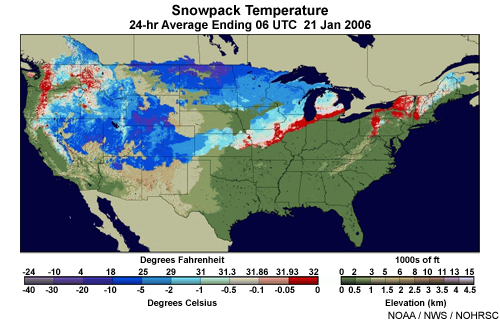 “In midwinter, snowpack stability changes as snowstorms come in and quickly load the pack, causing it to be unstable. As the snow adjusts to the new load, stability increases over the course of several days or even a week or more. What's it like to walk across snowpack in springtime when snowmelt is occurring? Snowmelt is discharged into drainages in mountainous terrain and into ponds, lakes, and relatively flat rivers in level terrain. Each drainage has a limit as to the amount of runoff it can handle, beyond which flooding will occur. The low-level temperatures of the atmosphere, with warmer temperatures leading to more melting. The presence and amount of liquid precipitation. In general, rain melts snow when atmospheric temperatures are relatively warm. But when they are very close to freezing, the rain usually freezes as it percolates into the snowpack. The heat release associated with this freezing warms the pack to near the melting point so that any additional heating will melt it much more quickly. The type of ground cover. If the surface is frozen soil or rock slab, little snowmelt will be absorbed; most of it will move horizontally, pool, or move downhill, increasing runoff. If the surface is unfrozen soil, the ground can absorb water more easily, decreasing runoff. Of course, snowmelt runs off faster in sloped regions than flat areas. “The water running down this road is melted snow that's flowing across the top of the ground. In thin areas of snow, the snow might actually be melting from all sides. The sun comes down into the top, melts the surface, heats up rocks on the ground, and melts the snow from the sides and bottom. 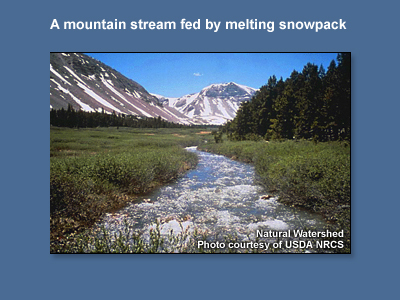 Where snowpack is deeper, melt water is produced near or on the snow surface. The notion of an “ideal” snowpack depends on one's perspective and interests. What's good for farmers may be bad for road crews. Consider the following scenarios. Whose interests does each one best match? Select the best answer for each scenario. (Note that each should only be chosen once.) When you are finished, click Done. This would benefit a rafting company. This would benefit a downhill skier. This would benefit a ski patrol. This would benefit a farmer or rancher. This would benefit a highway department road crew. A hydrologist needs to monitor water supplies to determine flooding potential. An avalanche forecaster needs to decide whether to issue any warnings. A climate researcher needs lots of ground and atmospheric observations to assess and monitor climate trends. These are the types of situations that require a steady stream of snowpack data gathered regularly throughout the cold season. Snowpack is monitored extensively over many areas of the world, usually by government agencies. There are two primary methods: remotely-sensed (primarily satellite-based) and onsite (in-situ). Both methods measure a standard set of characteristics throughout the full snowpack depth to provide a complete profile analysis. 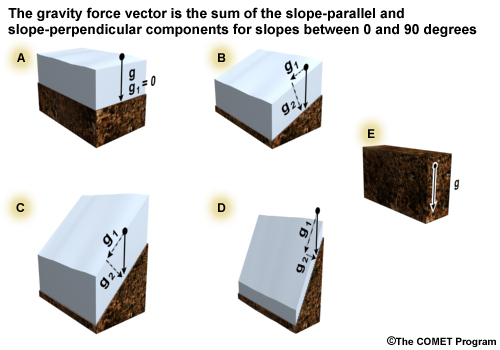 This section describes the various techniques used to assess snowpack, primarily in the context of avalanche stability. The techniques range from simple, hand-based tests to those that use complex tools to obtain precise measurements. Onsite measurements, known as snow courses, are an essential part of determining avalanche conditions—both current and past as well as those that may occur in the future. Onsite measurements are taken at fixed sites on both flat and sloped surfaces at regular intervals throughout the cold season. They are also taken at particular sites to address specific needs, such as the likelihood of avalanche formation. In these cases, a partial or full profile of the snowpack is assessed. In the United States, there are two types of onsite measurements: manual techniques and routine, automated, in-situ measurements called SNOTELs. 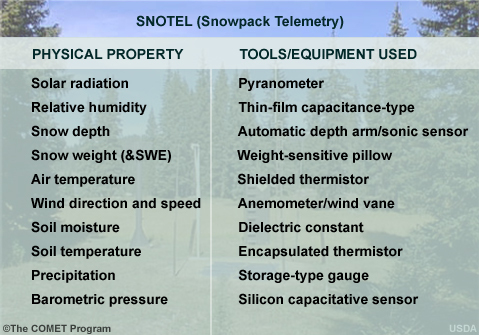 SNOTEL stands for snowpack telemetry. As of 2009, there were more than 1,200 manually-measured snow courses and over 750 SNOTEL sites in the western U.S. states, including Alaska. Before starting the discussion of onsite measurements, it is strongly recommended that you review two chapters of the American Avalanche Association's "Snow, Weather, and Avalanches: Observational Guidelines for Avalanche Programs in the United States" guide. 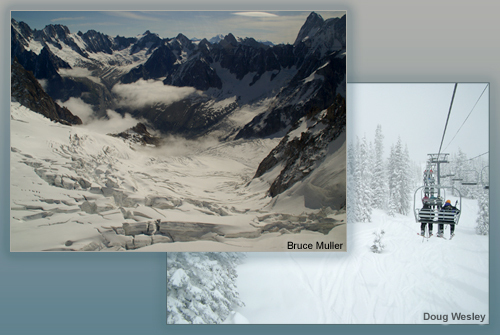 "Snowpack Observations” at http://www.avalanche.org/~research/guidelines/pdf/Chapter2.pdf. Please refer to it as you read through the module's descriptions of snowpack assessment techniques since it provides more detailed information than can be included here. The chapter can also be downloaded and used as a guide in the field. Manual, onsite observations are typically taken in snow pits dug out with shovels. 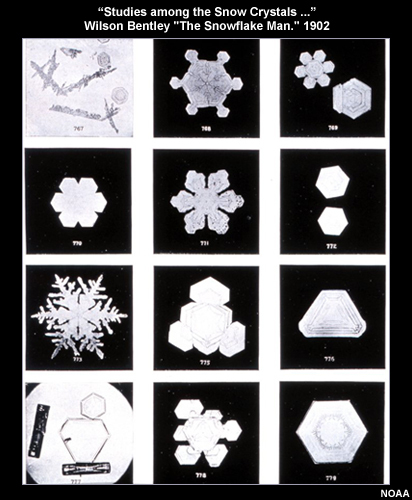 Visual observations are particularly good at revealing crystalline and other characteristics that are important to snowpack stability and melting. Ideally, snow should be observed in its native state, undisturbed by tracks, vegetation, rocks, or collapsed layers. The walls of the pit should be vertical and clean, and straight, vertical columns should be sampled. The primary goal of measuring a snowpack in the context of avalanches is to assess the stability of the layers. The measurement of all of the layer qualities is called a snow profile. We'll examine these characteristics in more detail on the following pages. You can get a quick sense of a snowpack's degree of wetness (its liquid water content) by doing a simple hand-based test that lets you characterize the snowpack as dry, moist, wet, very wet, or slush. Simply squeeze a handful of snow in your gloved hand and observe the amount of water present. Use this chart to determine the snow class. A more accurate and formal way of assessing the water content of a layer is to first measure its density (mass per unit volume, for example, grams per cubic centimeter). 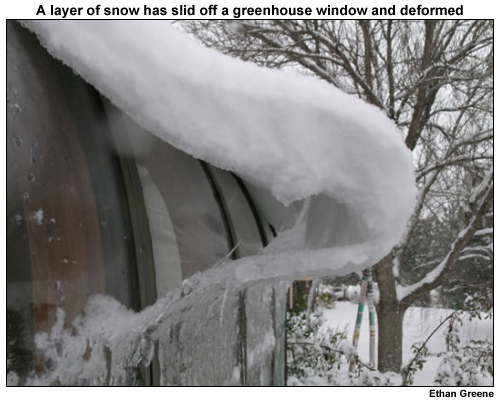 This is done by cutting out a predetermined volume (chunk) of snow and weighing it. 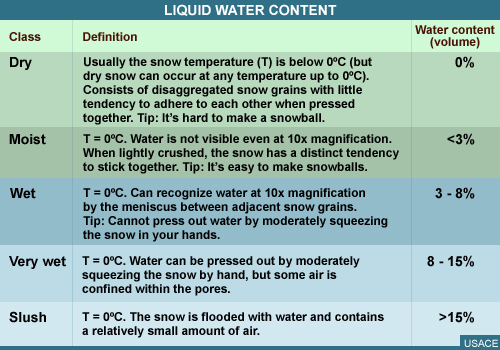 The density is then converted to water content (snow-to-liquid ratio) by dividing the measured density by the density of water. Click the links to hear Ethan discuss the following topics. “A federal sampler is a device that lets you easily measure the snow water equivalent through the entire depth of the snowpack. It's commonly used by federal agencies that are trying to figure out how much water is in certain basins for runoff and agricultural forecasting. “A pit wall is a cross-section of a snowpack. It shows the evolution of the pack, from the winter's worth of snow that accumulated on the ground and metamorphosized through the different winter weather events and to its condensation and melting in springtime. To examine the layers, I'll run my hand across the pit wall and feel for hardness changes. Since it's such a warm day, there's subsurface melt just below the snow surface, and a suspended crust is starting to form that might eventually turn into fermspegial. Underneath, we've have melt forms (polycrystals) that are undergoing melt right now. Below that, there's a harder crust that's the result of multiple melt-freeze cycles over the last few weeks. The upper part of the pack is melting and starting to get some free water during the day. At night, it refreezes into a very hard layer. This is what's left of the hard layer from last night. It will refreeze into a very strong layer tonight. As we move down, different stages of melt metamorphism are occurring. A few, little, thin ice layers are forming as the water percolates down through the snowpack, pools in certain places, and refreezes. That's really what's happening in the upper part of the snowpack. We have a couple of harder layers. This might have been the snow surface several few weeks ago when we were in a warm period (in March). Depth measurements are important to the avalanche community, hydrologists, and ski resorts since they indicate the amount of snow on the ground and provide an estimate of the amount of snow that would slide were an avalanche to occur. 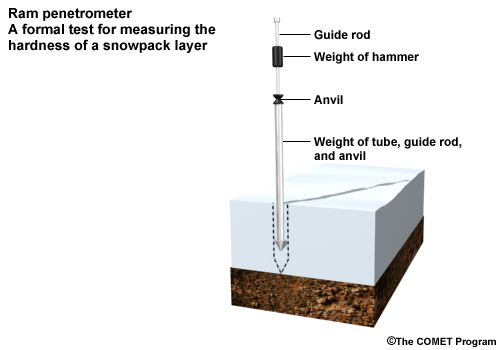 A simple way to measure the thickness of a layer or the entire snowpack is to use a ruler. Since snow depths can vary widely in complex terrain, it is important to take multiple measurements. Click the links to hear Ethan Greene describe another technique for measuring snow depth and the impact of spatial variability on depth measurements. “This may not be the type of snowboard you're used to seeing, but it's the snowboard we use to measure new snow events. You need to find a site where you can place the board right on the snow surface so it's as even to it as possible. That will allow snow from precipitation events to accumulate on the board without the board really affecting the accumulation very much. To help determine the stability of a snowpack, we measure the relative hardness of the layers. This refers to the number of bonds per volume, which indicates the degree to which the grains hold together under external pressure. A very hard layer over a very soft layer decreases stability, while a very soft layer over a very hard layer increases stability. In the field, a layer’s degree of hardness is defined by the largest object that can penetrate the snow. You can get a quick sense of it by gently pressing objects of varying sizes into the snow and determining the largest object that can penetrate it. 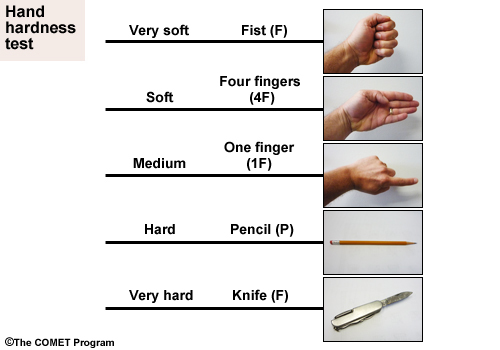 In order of increasing hardness, these are a fist, four fingers, one finger, a pencil, and a knife. The more formal way of determining hardness is to use a ram penetrometer, which measures resistance as it is thrust into the snowpack layer. The greater the resistance, the greater the layer’s degree of hardness. 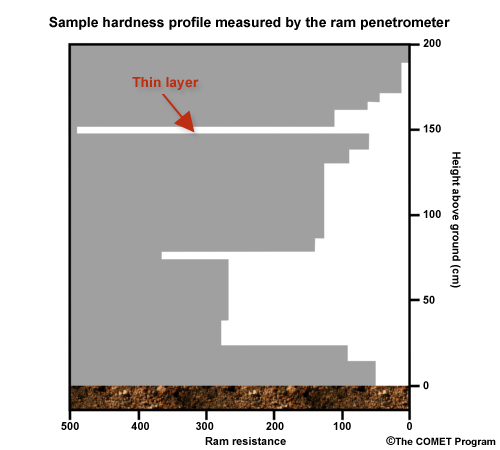 Here’s a hardness profile obtained with a ram penetrometer. What do you think the thin layer near the top of the snowpack consists of? Select the correct answer(s), then click Done. Penetrometer resistance is very high for the thin layer, indicating that the grains are tightly bonded and likely to be crust. It could also be a buried dirt layer, since these often form hard ice layers. It cannot be depth hoar or low-density grains; these have a low degree of bonding, which makes them easy to penetrate. Snow grain type and size are important to measure because of their relation to snowpack stability. 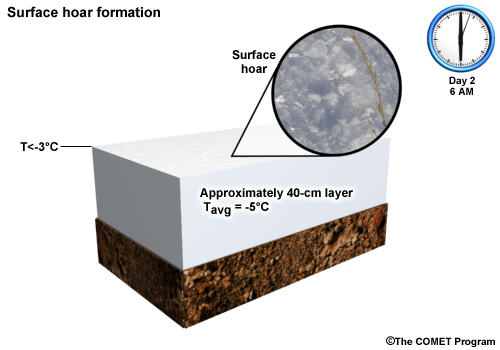 Hoar and other facetized grains are typically large in size (over ~2mm in diameter) and reduce snowpack stability. Simple magnifiers are used to assess the type of snow grain within a layer. The graphic shows different grain types. The temperature of a snowpack layer should be measured with a thermometer in the shade and not be contaminated by heat from the fingers. You can estimate temperature gradients by taking measurements at several depths in the pack. Notice the difference between day and night temperatures in the top of this snowpack. As you’ll recall, solar radiation warms the top 15 to 30 cm (6 to 12 in), whereas outgoing infrared radiation cools the very top few mm. Shear quality is the resistance of the layers in a snowpack when an amount of pressure is applied to one layer, such as the top, and the rest are left alone. Shear quality is measured by exerting increasing amounts of vertical pressure on the top of the snowpack until the top layer begins to move down the slope. There are several types of shear quality tests. 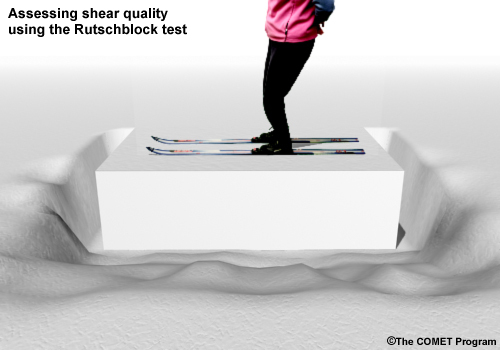 The Rutschblock test is a rather crude, time-consuming technique done on-site by a snowpack expert on skis. First, the skier digs a u-shaped trench around an undisturbed block of snow, leaving the block attached on the uphill side. Then he or she performs a series of increasingly stressful maneuvers to see if the block will fail at any weak layers and begin to move. These range from gently stepping on the block to jumping up and down on it. The point at which the block moves is recorded. The Stuffblock test is a variation on the Rutschblock test. It is more quantifiable in that pre-set amounts of weight are exerted on a column to see when it will fail. To do the test, you fill a stuff sack with ten pounds of snow and drop it from increasingly greater heights onto a shovel blade on top of a column of snow, noting the point at which the column fails. The test can be done by skiers and non-skiers alike, which is an advantage in some situations. It’s pretty easy to interpret the results. Fractures typically propagate across the entire column within one or two additional loading steps on unstable slopes. If the fracture propagates across one or more layers or breaks, it’s unlikely that fracture propagation will occur. There are some limitations to be aware of. The test can overestimate snowpack instability, for example, when a thick hard layer overlies a weak one, or the upper layers of a pack are soft. Like other tests, the ECT should be done in an area that is representative of the entire slope. For more information on the ECT, access the paper “The Extended Column Test: A Field Test for Fracture Initiation and Propagation” at http://www.avalanche.org/~nac/NAC/techPages/articles/06_ISSW_Simenhois.pdf. 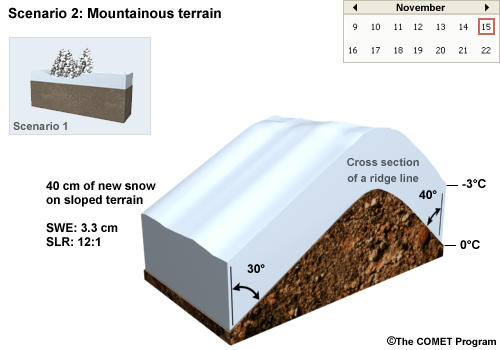 Here’s a snow profile—the culmination of the in-situ, snowpit-based, snowpack measurement process. The results are depicted vertically on the plot, making easy to interpret the stability of the snowpack layers. Which of the following statements are true of the temperature profile (the line in blue)? Select the correct answer(s), then click Done. The correct answers are b and d.
Conditions are warmer in the lower portion of the snowpack: near 0°C (32°F), which is just barely freezing. Melting is not significant because all of the temperatures are at or below freezing. The vertical temperature gradient in the 20-cm to 70-cm (8-in to 28-in) layer is significant since it’s conducive to both the transport of moisture upward and the growth of the upper grains at the expense of the lower grains. This leads to the formation of depth hoar, which decreases snowpack stability. 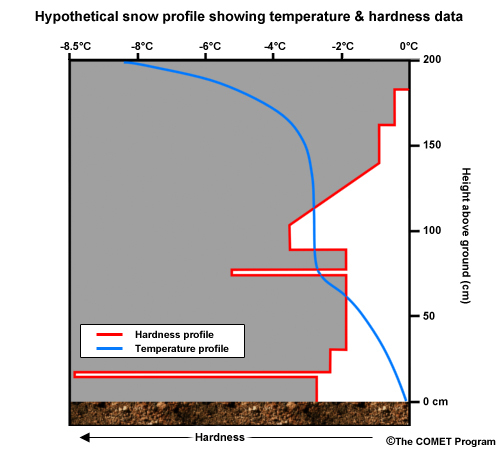 What can you infer from the hardness profile in red? Select the correct answer(s), then click Done. The extremely high hardness values at 15 and 70 cm (6 to 28 in) are indicative of ice. The deep snowpack above these shallow layers may be less stable and prone to slide if the slope is steep enough. The top 35 cm (14 in) or so exhibits very low hardness and is probably low-density snow. Given the layers with highly variable degrees of hardness, it's clear that there have been periods of melting and snowfalls of varying densities during the winter; it has not not been monotonous. The United States’ Natural Resources Conservation Service operates an extensive, automated system for collecting snowpack and related climatic data in the Western United States and Alaska. 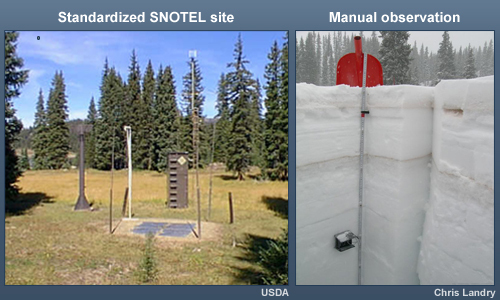 This system is called SNOwpack TELemetry or SNOTEL for short. 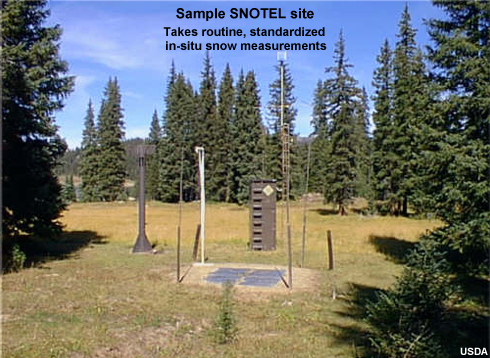 The SNOTEL network consists of over 750 measuring sites over complex terrain. The table shows the physical properties measured and tools involved. This example shows SNOTEL SWE measurements for a site in California in 2008 and 2009 (up to mid-March). The plot is useful because it shows the data in a historical context, since 1971. Note that the maximum values of SWE typically occur in late February/early March. Remote sensing of snow cover is done by low-orbiting satellites that have the spatial and temporal resolution required for accurate snow-related measurements. 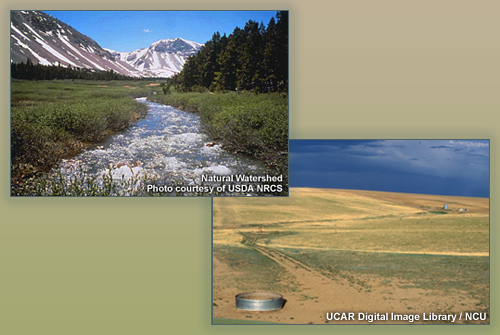 Satellite observations have advantages over traditional ground measurements. For example, they cover large areas with near-uniform resolution and retrieve data from remote regions of the world where onsite measurements can be time consuming or nearly impossible to take. Microwave wavelengths are best for assessing snow properties from a remote sensing perspective—far more so than visible or infrared wavelengths. That’s because microwave energy can penetrate snowpack and is reflected and emitted both from the surface and deeper within the pack. This makes it sensitive to parameters such as snow depth, snow water equivalent, snowpack temperature, snow crystal type, wet-dry state, as well as soil conditions below the snowpack. In addition, microwave instruments also penetrate cloud cover and operate during both day and nighttime. This makes them useful for detecting snowpack conditions on a 24-by-7 basis. 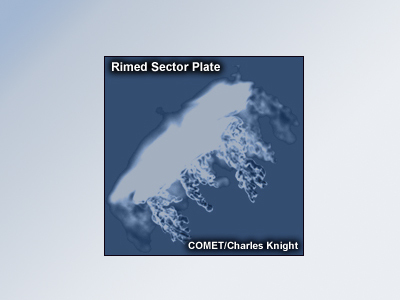 The rest of this section presents products made from satellite-derived snow observations. 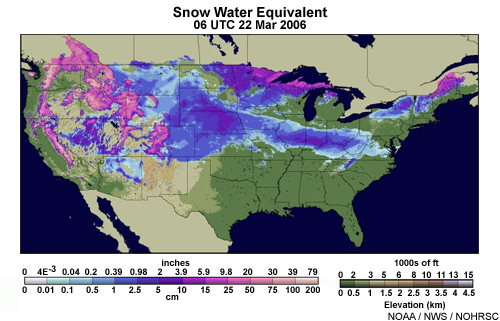 Snow water equivalent (SWE) estimates have widespread applications in hydrology, agriculture, and emergency management. This example, created from satellite and surface observations of SWE, shows snowpack conditions during late winter in the CONUS. Notice the high SWE values over the western mountain ranges and the extreme northern parts of New England, and the lower values (10 to 15 cm or 4 to 6 in) over some of the flatter areas of the northern fringes of the U.S. Snow cover estimates made primarily from satellite data are important to hydrology and provide critical input to numerical weather prediction models. 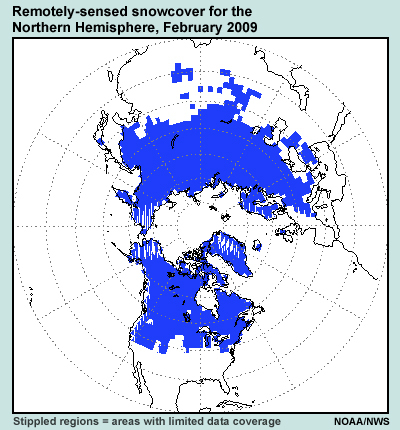 In this example, notice the extensive snow coverage over the higher latitudes of the Northern Hemisphere in February 2005. 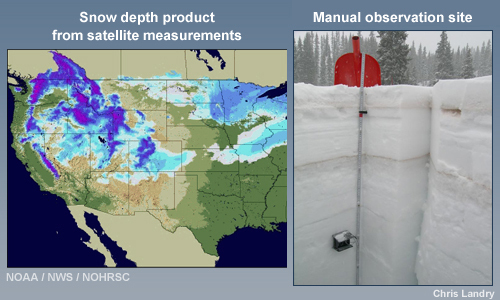 The snowpack depth product is made from microwave satellite data and is used to determine post-snowstorm depth. This information is of interest to, for example, transportation agencies and those involved with snow recreation. 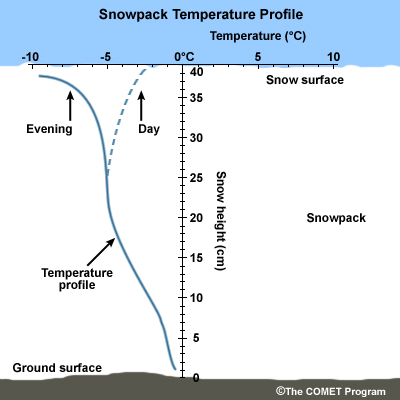 Microwave satellites assist in determining the detailed distribution of temperatures at the top of snowpack, which is useful to hydrologists and others interested in assessing and predicting snowmelt. Temperatures at the top of the snowpack are also used to assess snowpack stability, including the potential for crusting at the top of the snowpack and surface hoar formation. 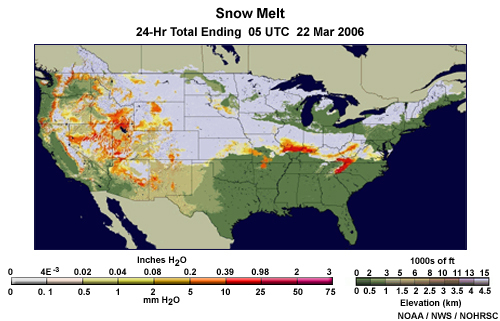 Real-time estimates of snowmelt are possible using microwave satellite data. The product helps identify areas under threat from flooding and is used to analyze soil moisture through the late winter and springtime months. NOAA’s National Operational Hydrologic Remote Sensing Center (NOHRSC, http://www.nohrsc.nws.gov/) and the National Snow and Ice Data Center (http://nsidc.org/) display these types of products for operational users. 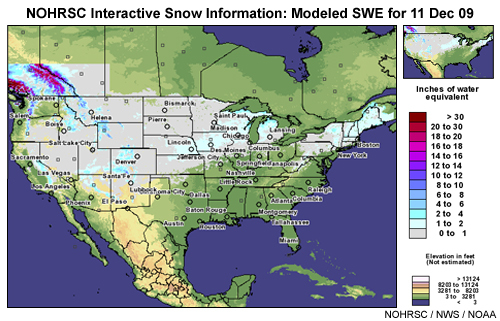 The NOHRSC site has an “Interactive Snow Map” feature that lets you display all of the remotely sensed and in-situ global snowpack data for any site of interest in the United States. Phase changes: Radiation and conduction transfer thermal energy and induce changes in snowpack between solid ice, liquid water, and water vapor. All phase changes induce either cooling or warming of the surrounding air depending the type. Evaporation and sublimation cool the immediate atmosphere while condensation warms it. You have reached the end of the Snowpack & Its Assessment module. Please consider taking the Quiz and sending a User Survey.